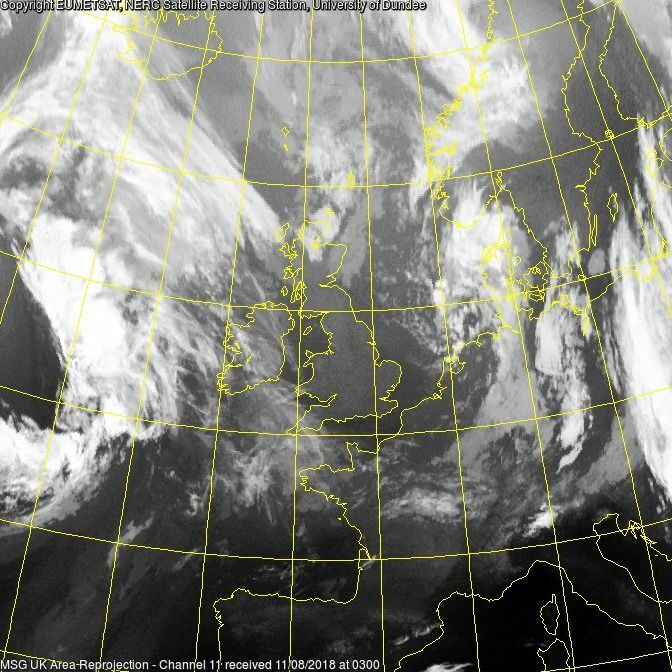 This morning's fax updates seem to be pushing the warm sector and cold front through a tad quicker on Sunday and the 500mb anom. 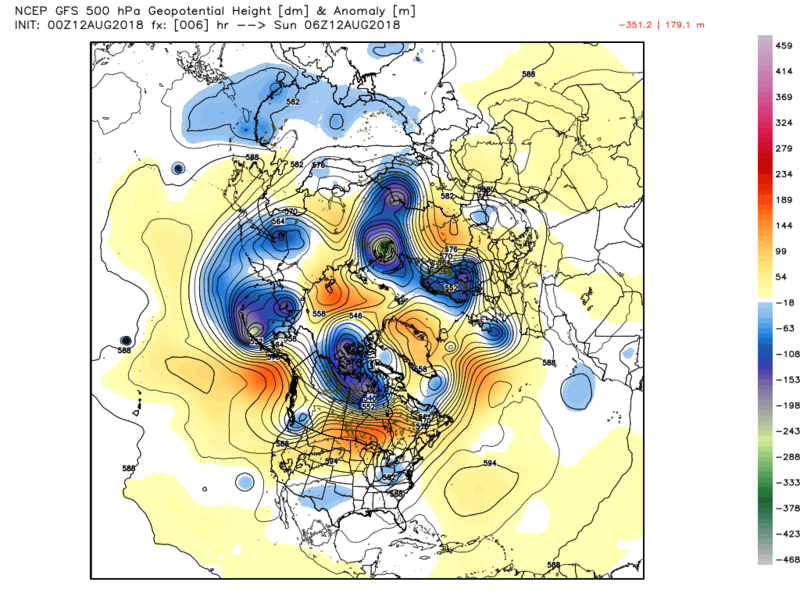 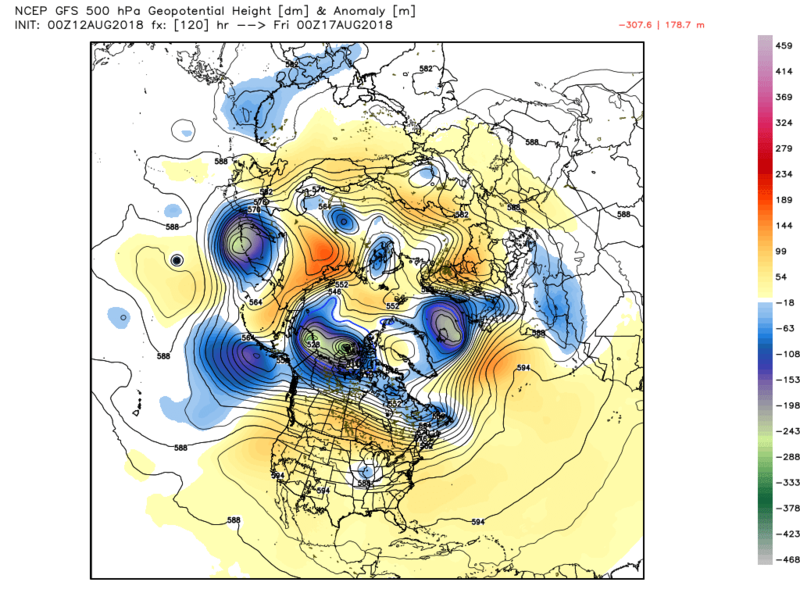 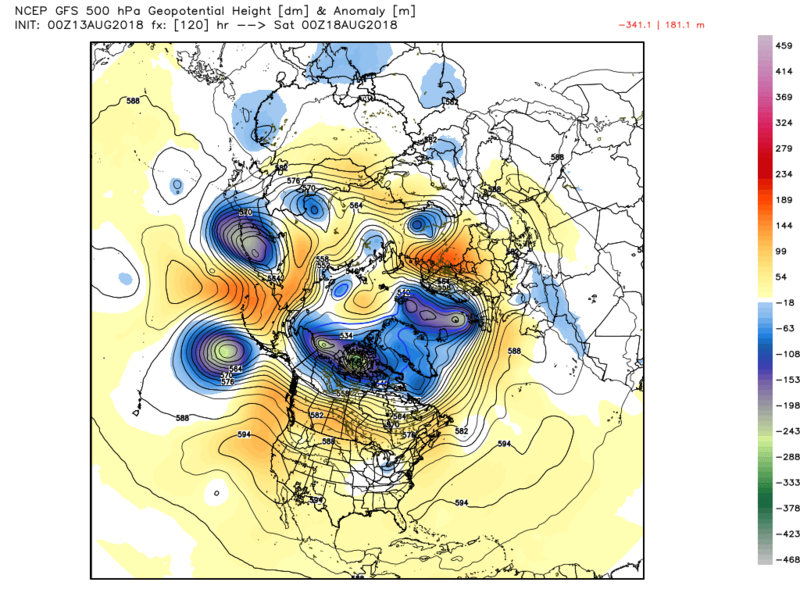 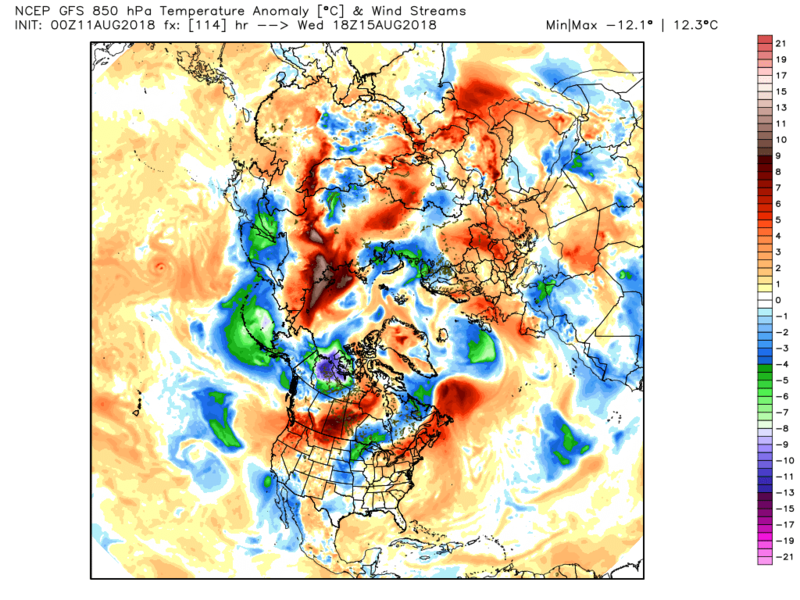 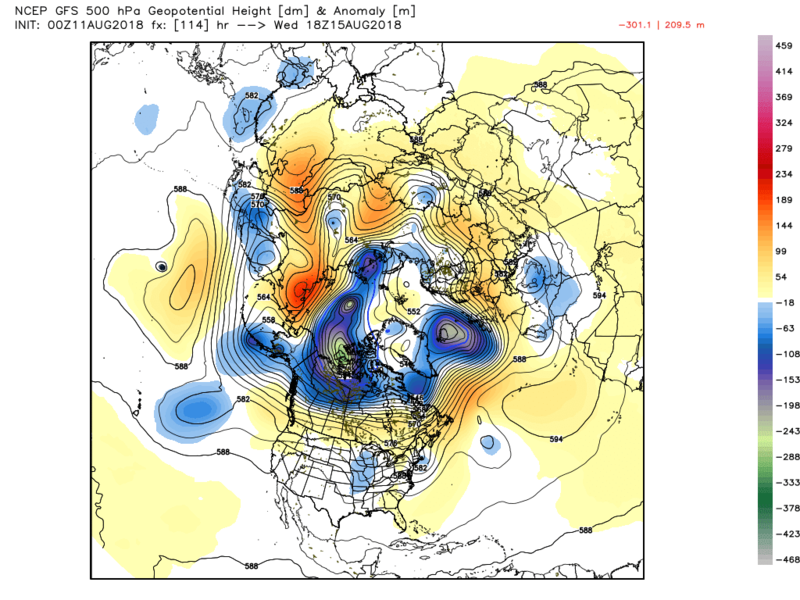 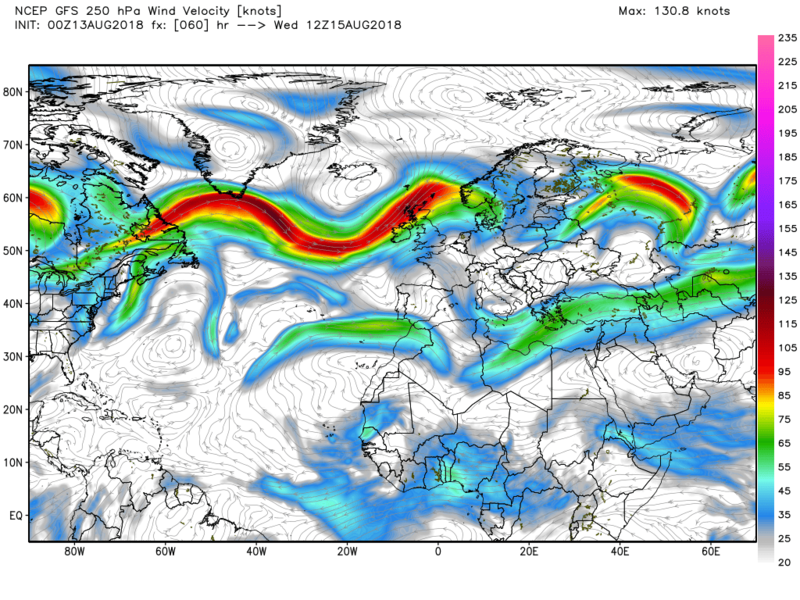 and 300mb jet more or less sums up the ecm. 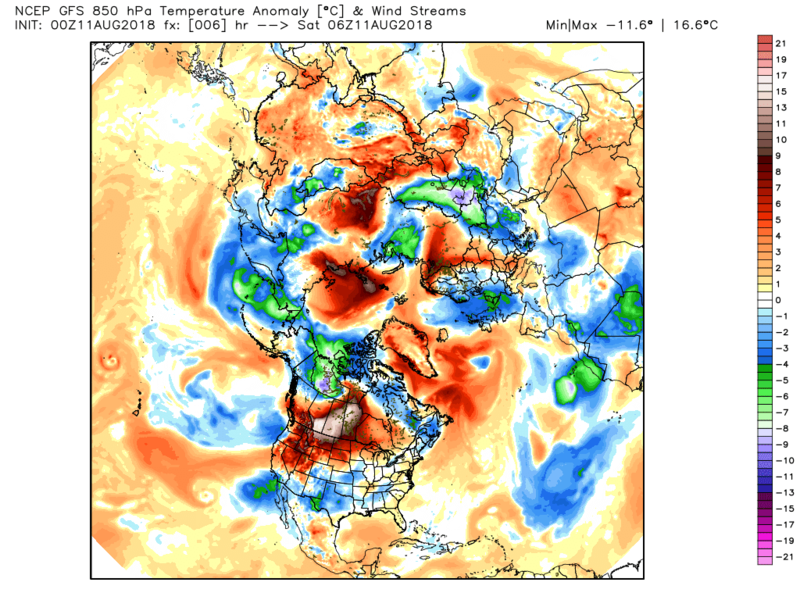 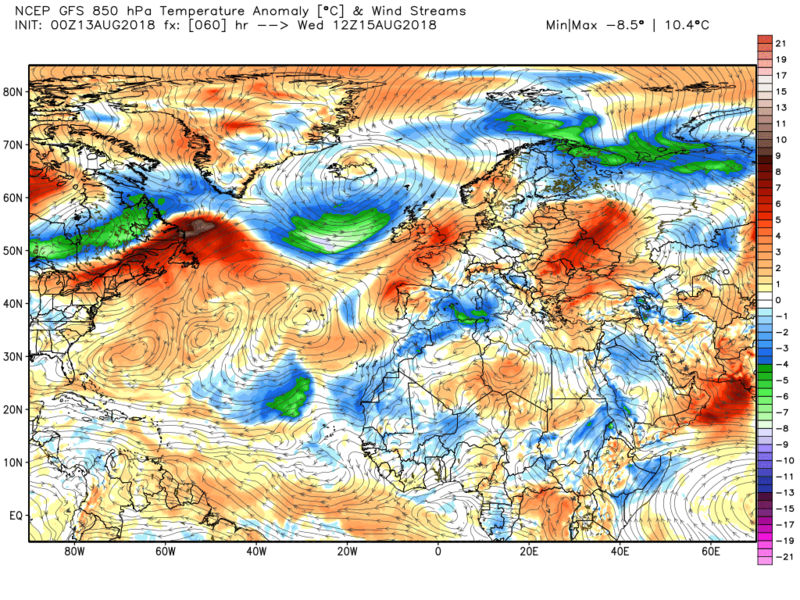 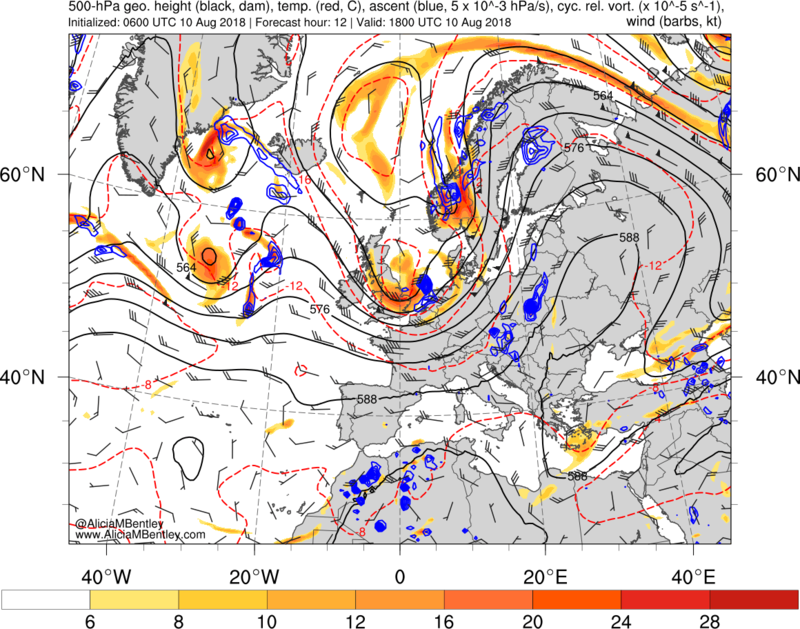 Unsettled with the airmasses over the Atlantic having their usual phasing battle. 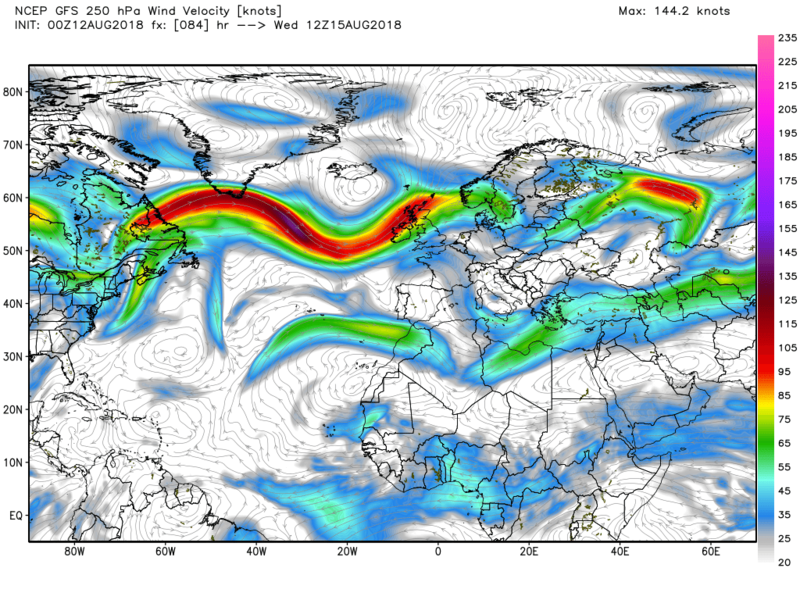 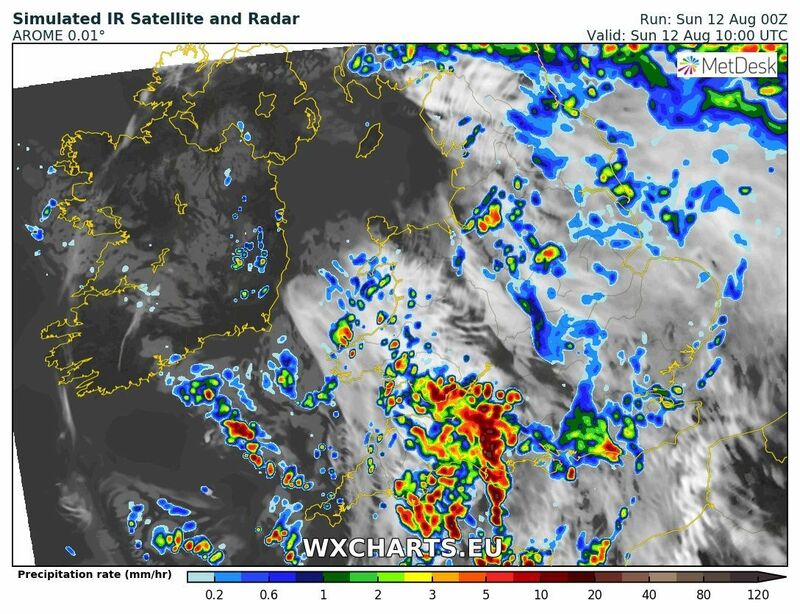 As Mat Hugo pointed out in a tweet the main reason for these hefty showers is the upper trough and associated vorticity and a little surface heating. 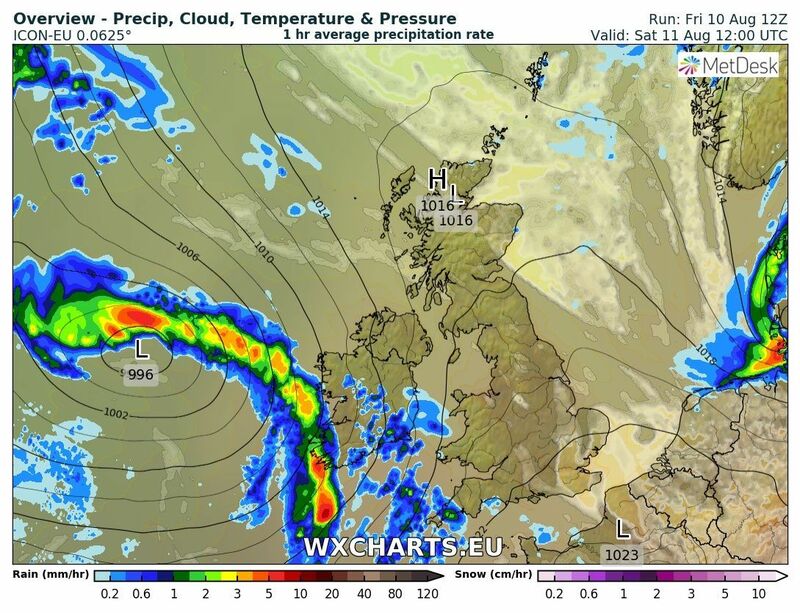 The chart from Alice Bentley's excellent site. 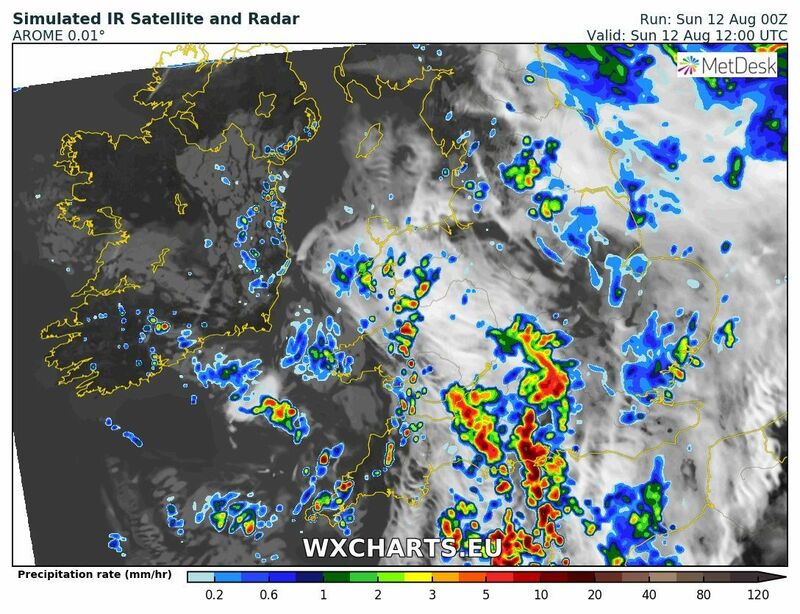 Clearer weather has already arrived in the west and the heavy showers in the east should also clear into the North Sea this evening leaving a cool clear night in most places. 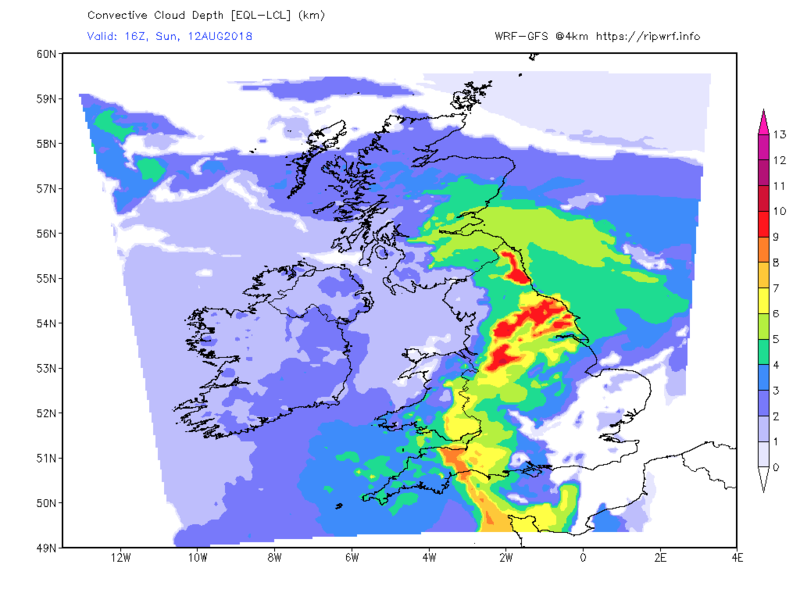 But in the early hours cloud and patch rain will encroach the south west to be followed later in the morning by more substantial rain fall which will track north east. 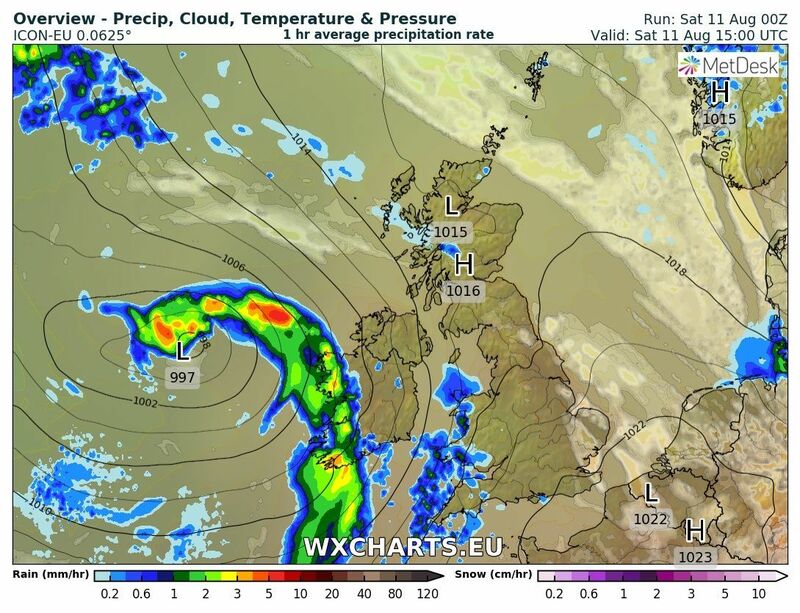 There is apparently still some uncertainty with timing of this so at the moment just a glance at the Icon't take. 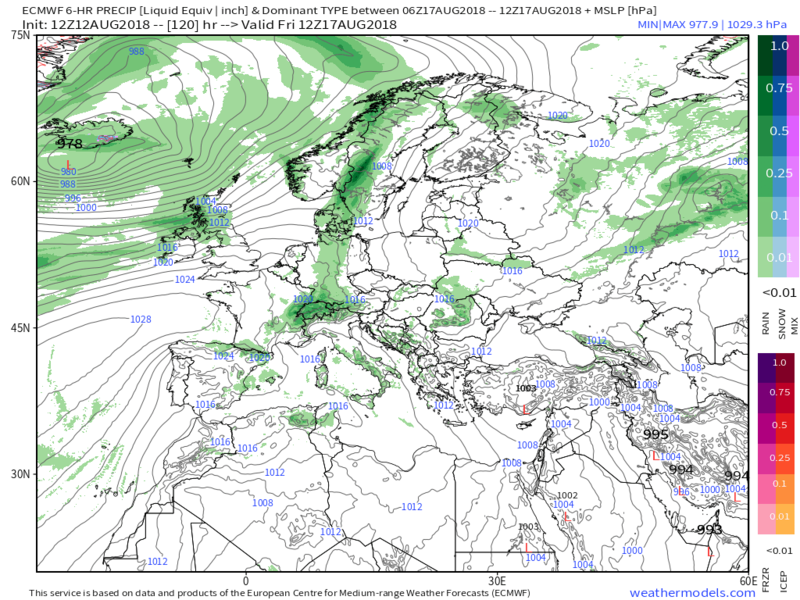 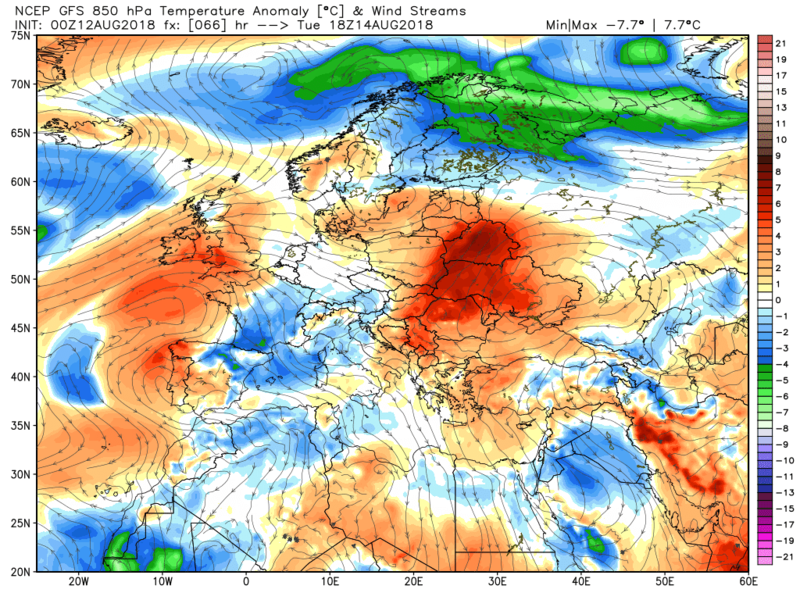 According to the gfs it is interesting that as the upper trough moves east after the weekend it stretches a way south, as high pressure ridges on it's western flank ,which very shortly creates a cut off low pressure area over the Mediterranean. Will this be important at a later date? 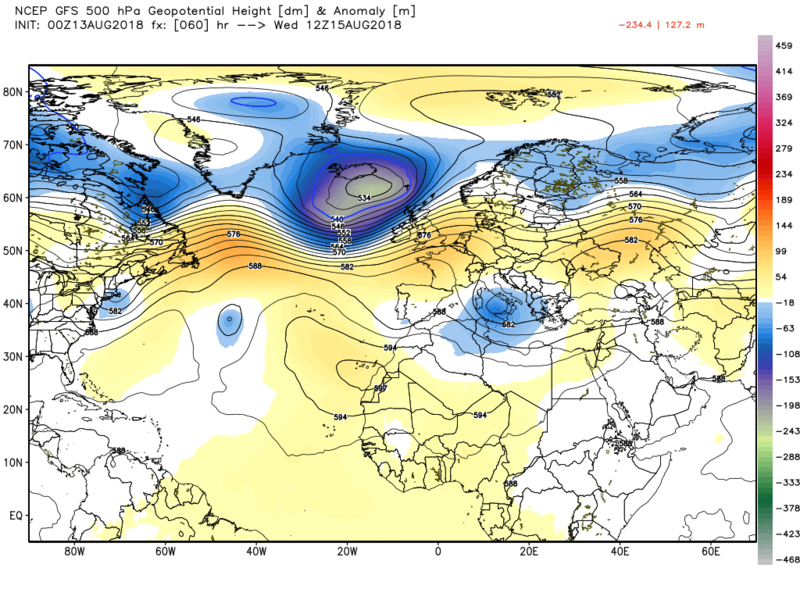 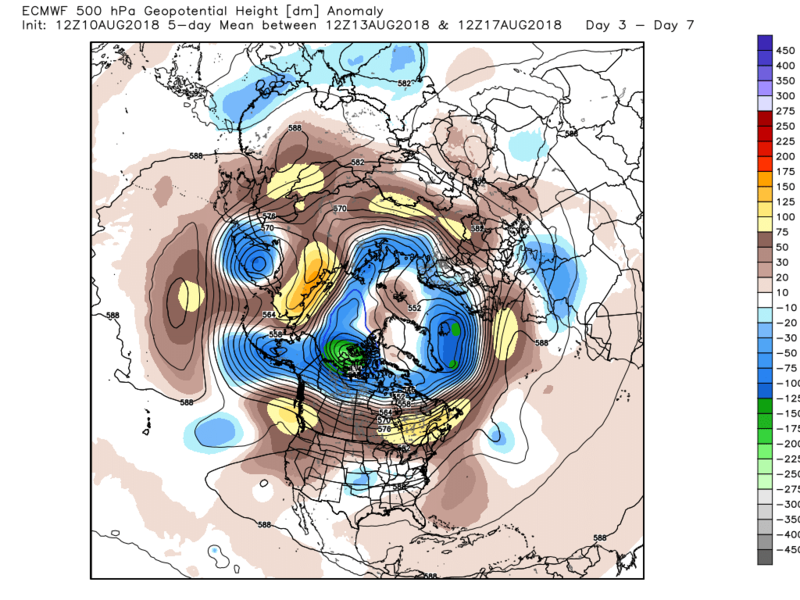 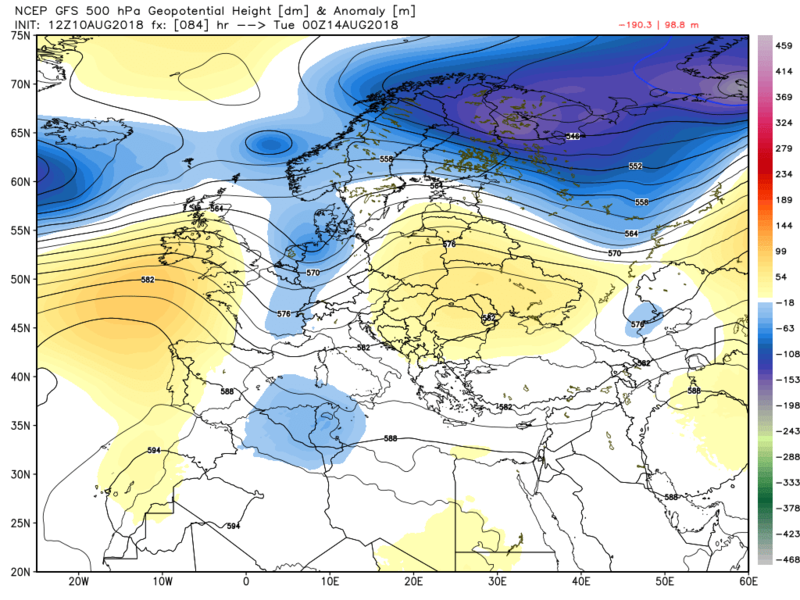 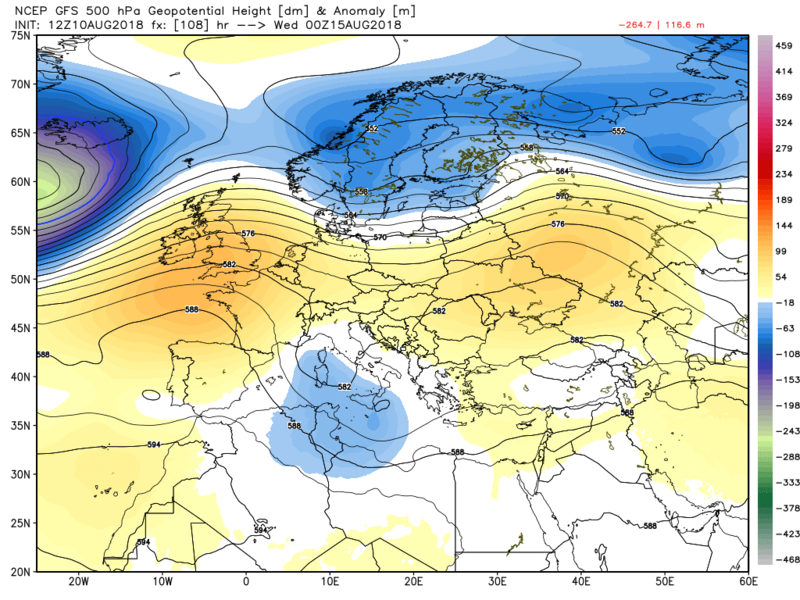 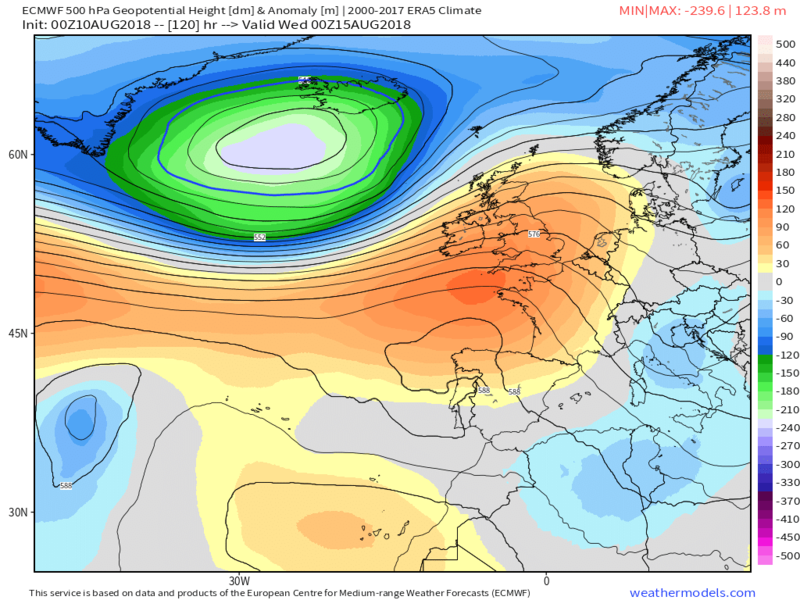 A pretty illustrative overview in the short range of the ecm, which could be used as a summation of the whole run, of the two major influences competing within this pattern, relative to the UK. 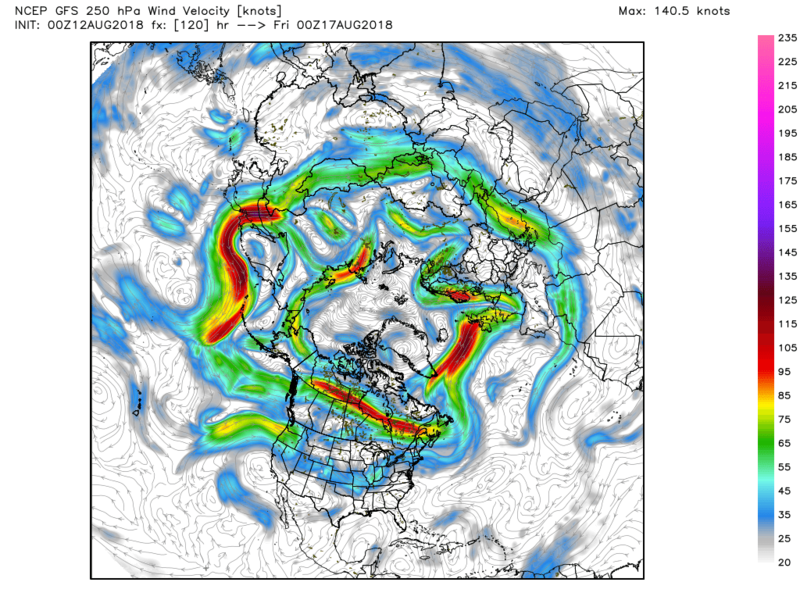 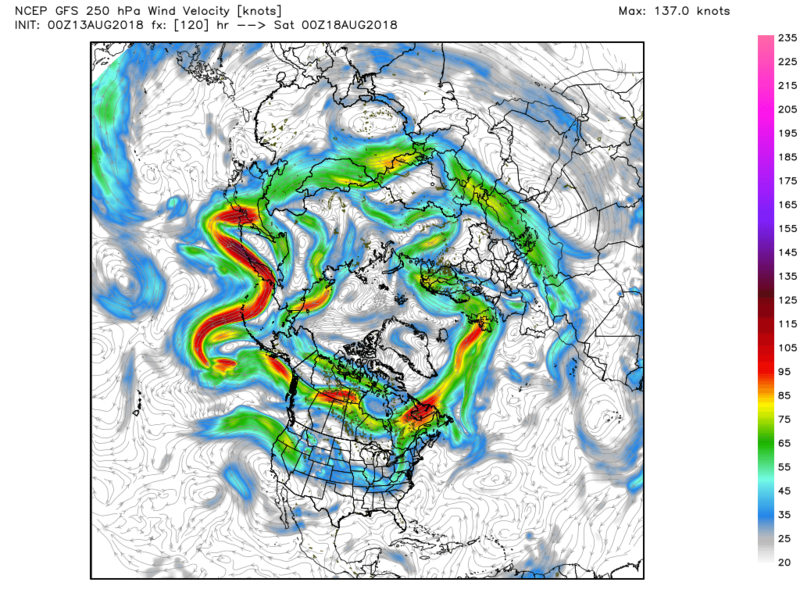 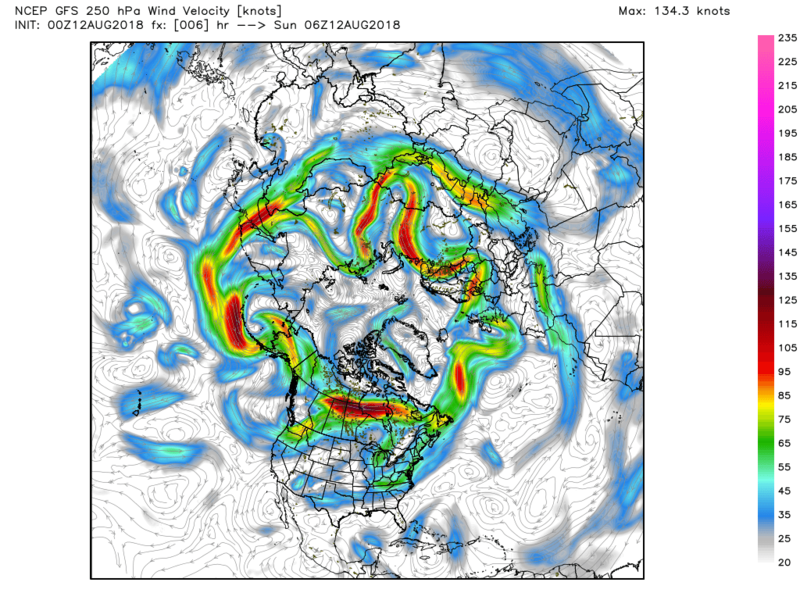 The trough/energy exiting northern Canada east bound and high pressure to the south attempting to puhh north with the strong thermal gradient/jet dividing the airmasses. 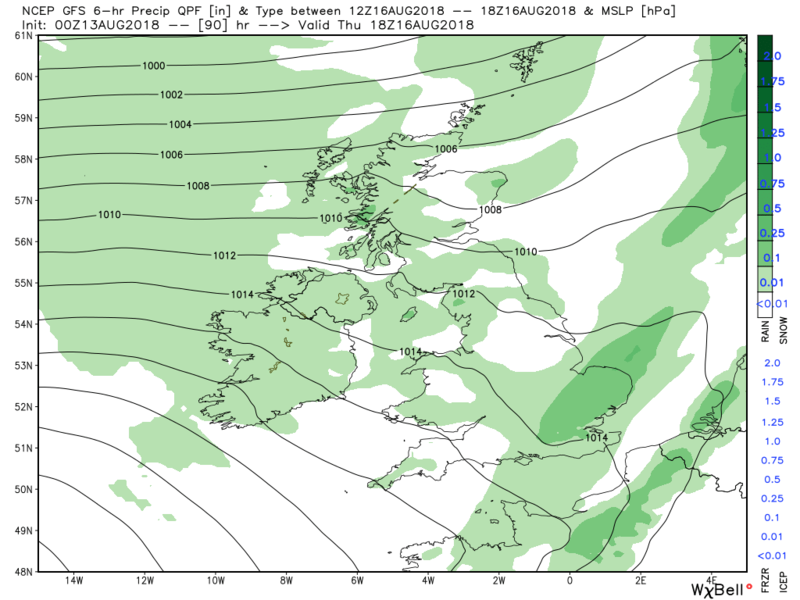 How they phase determines the detail of the weather over the UK as the run progresses and you can see how this can vary relatively early on in the rruns by comparing the gfs and ecm. 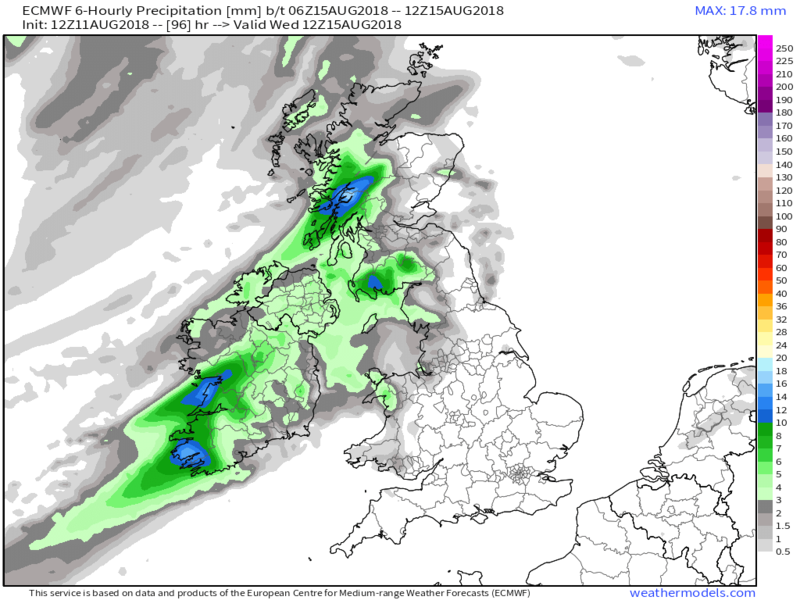 West is best if it's rainfall you are looking for but everyone gets wet at some time. 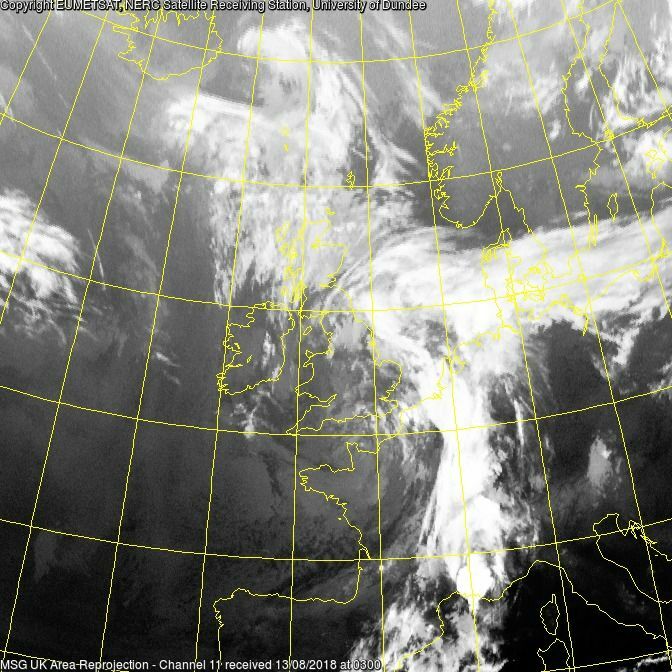 It's been a clear and pretty cool night in most places but through the night cloud has encroached from the south west courtesy of an approaching warm front. 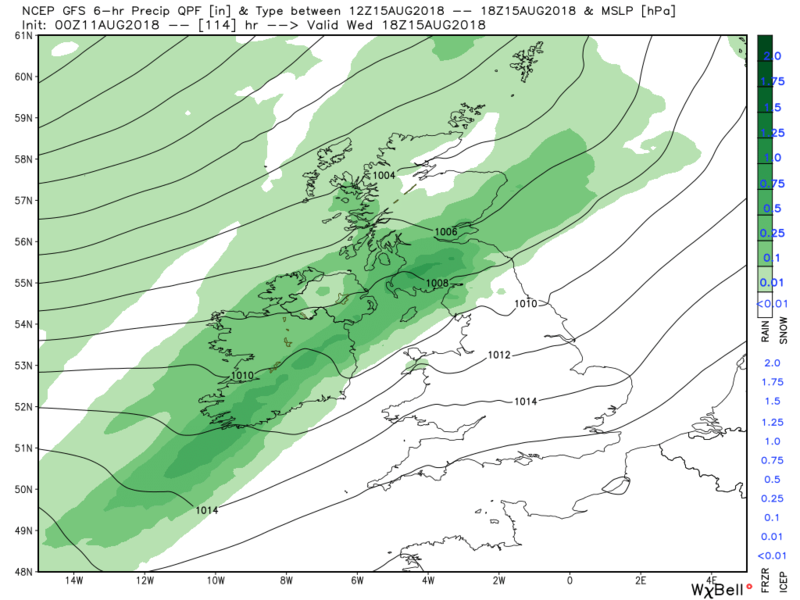 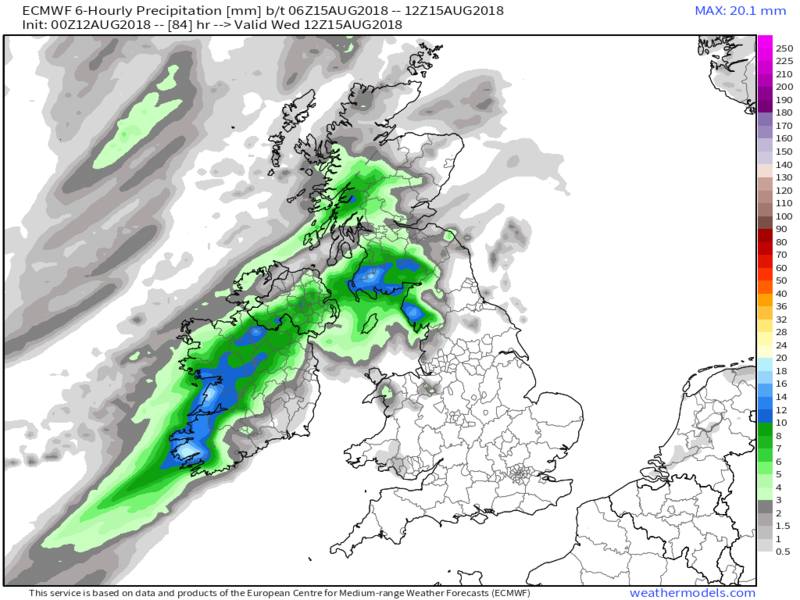 Overnight and through Sunday the low pressure associated with the fronts slowly fills over Ireland as the cold front makes slow progress east thus a pretty cloudy and wet day for many areas with some heavy bursts in the south but turning clearer in the west later behind the front. 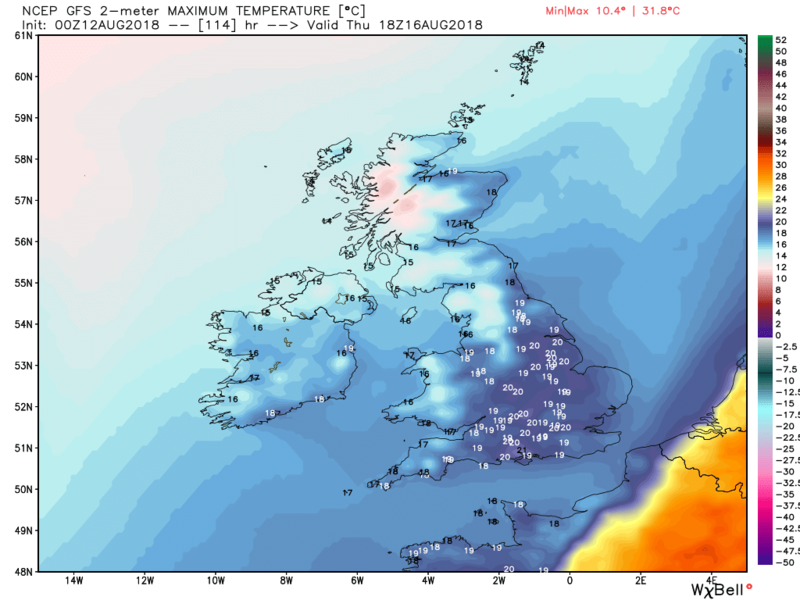 Some regional temp variations within this scenario. 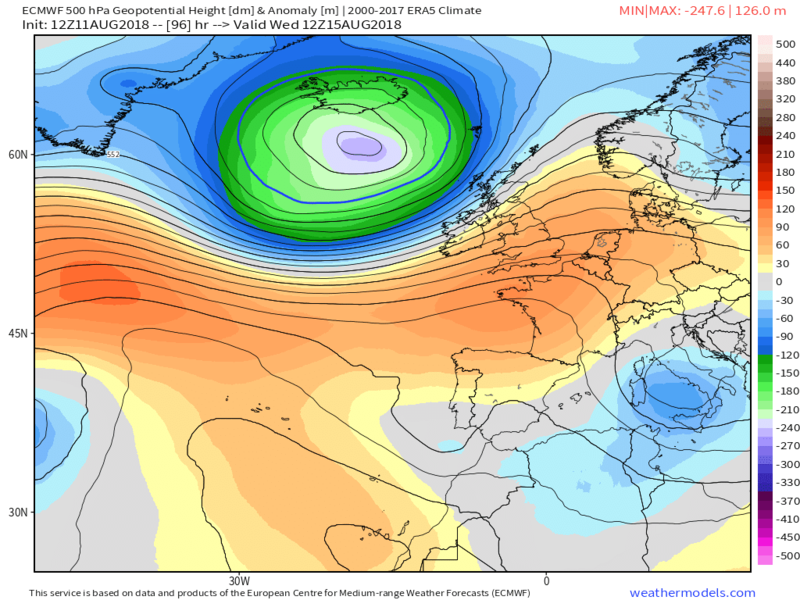 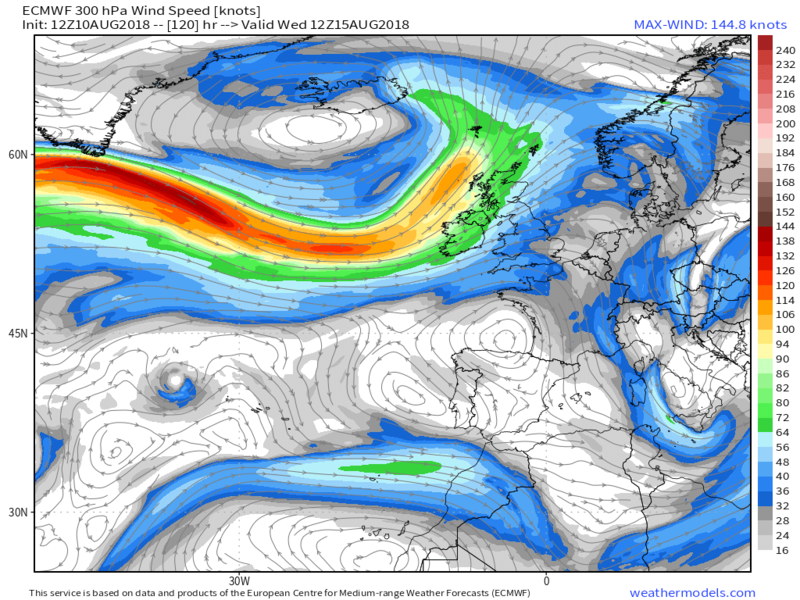 By Tuesday the ridge is quite influential in the south but systems are still winging around the norther edge thus tending to a N/S split as a frontal system brings cloud, patchy rain and strengthening winds to N. Ireland and Scotland and perhaps northern England. 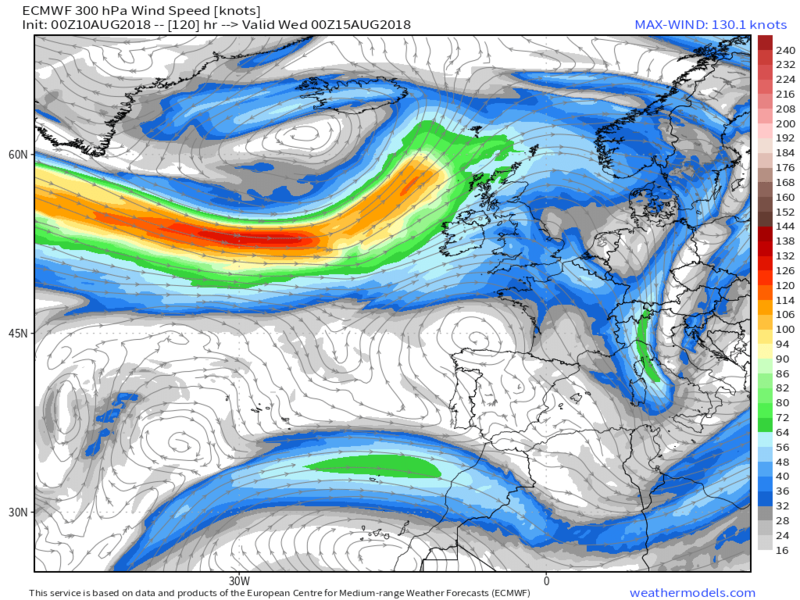 By Wednesday the NH profile has the upper trough to the west digging a fair way south and with ridging to the east this results in a fresh south westerly, the ridge no longer in play, airflow which advects warmer air into the UK, with particular emphasis on the south/southeast. 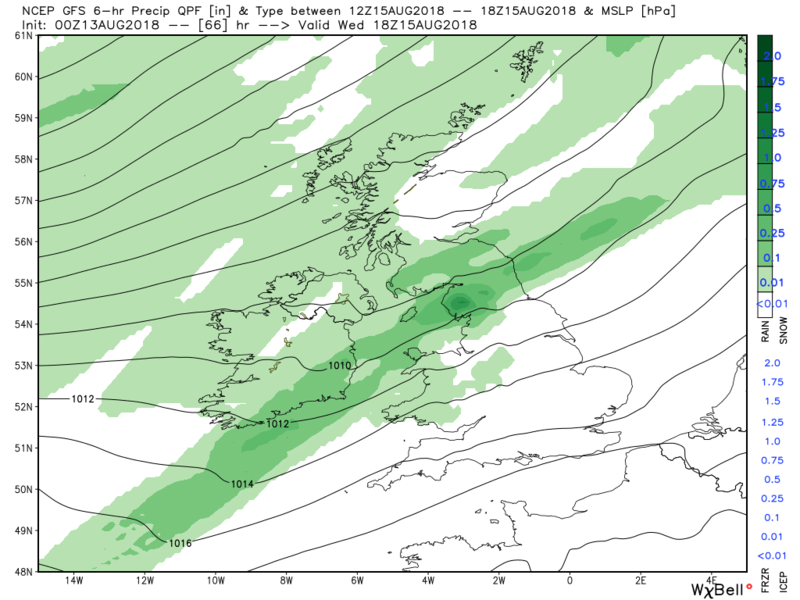 But still very much a N/S split on the surface with low pressure to the north west and associated cold front bringing more rain and quite strong winds to N.Ireland and Scotland whilst the south stays dry and quite warm. 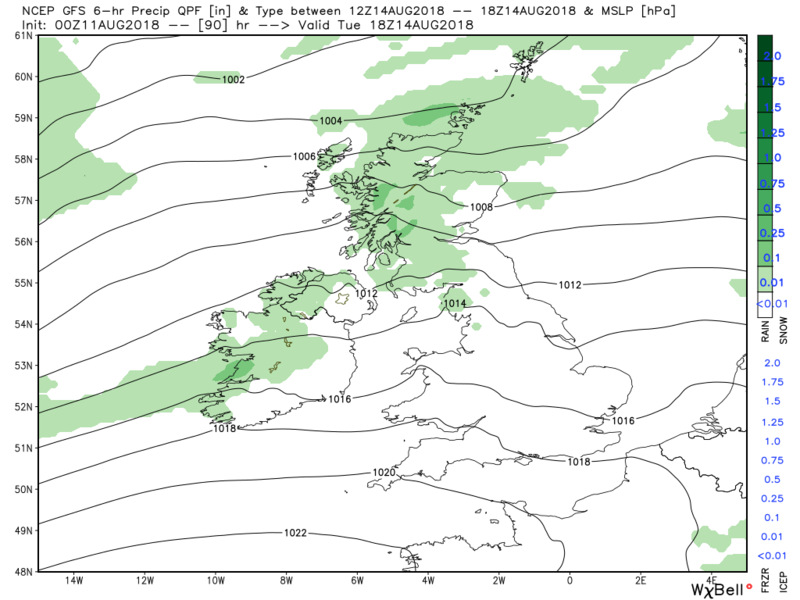 The latest fax charts and the 1500 UTC geostationary which shows the cloud from the preliminary warm front but the heavier rain is on the approaching fronts just to the south west and these will be accompanied by an increasing sw wind. 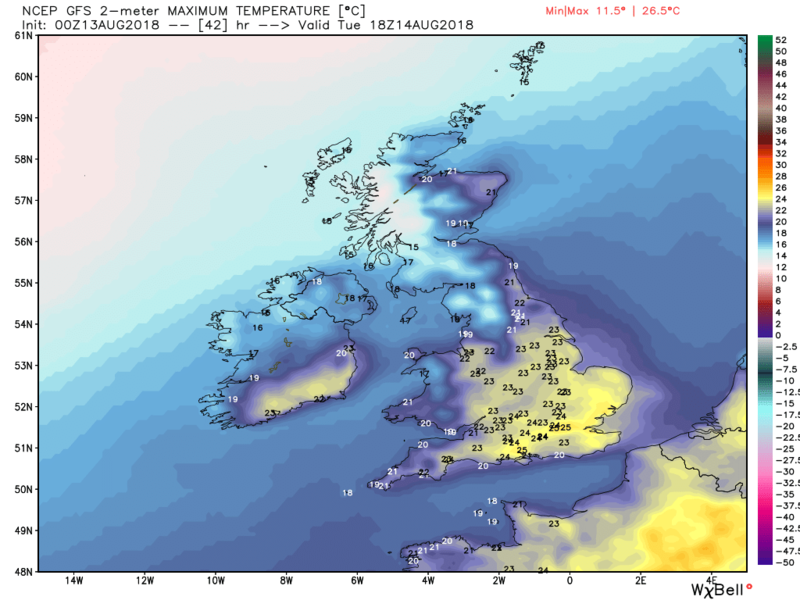 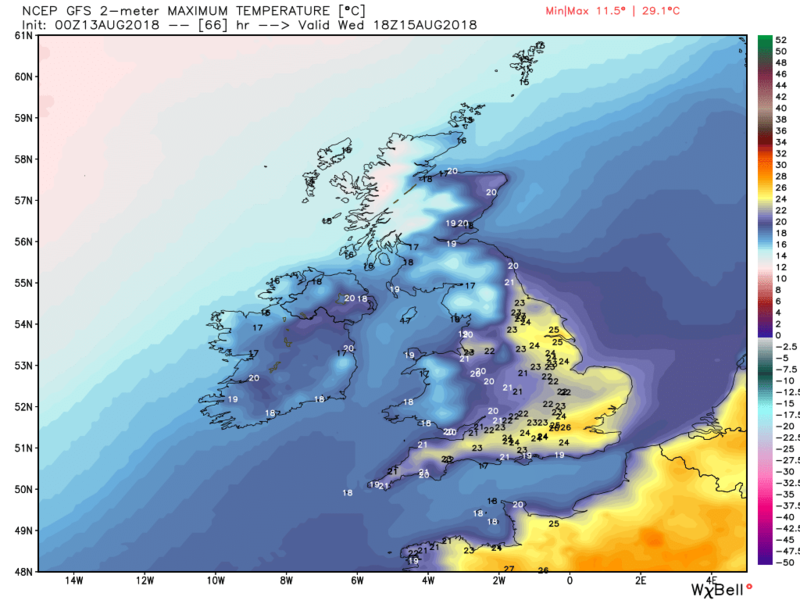 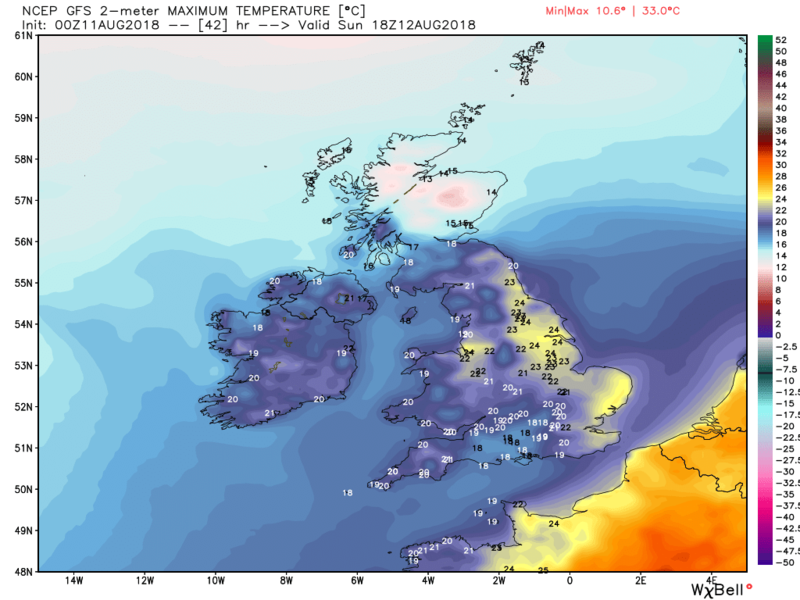 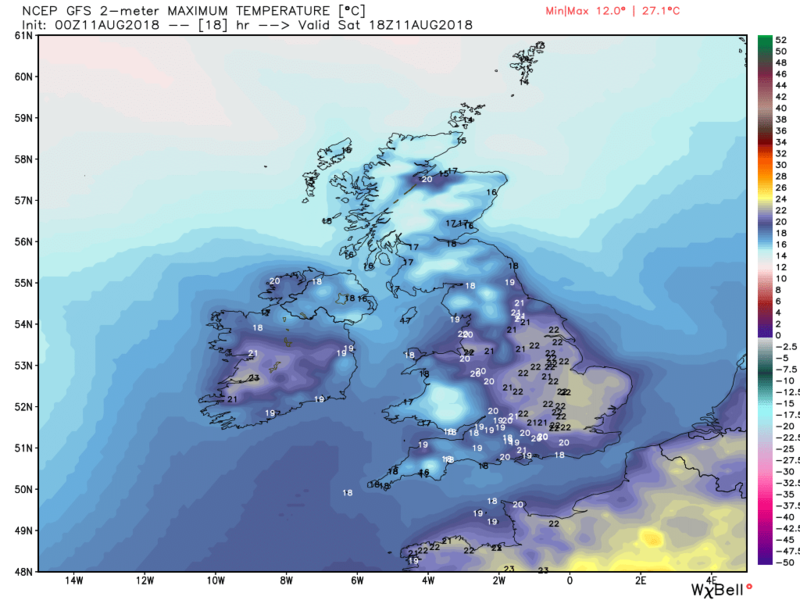 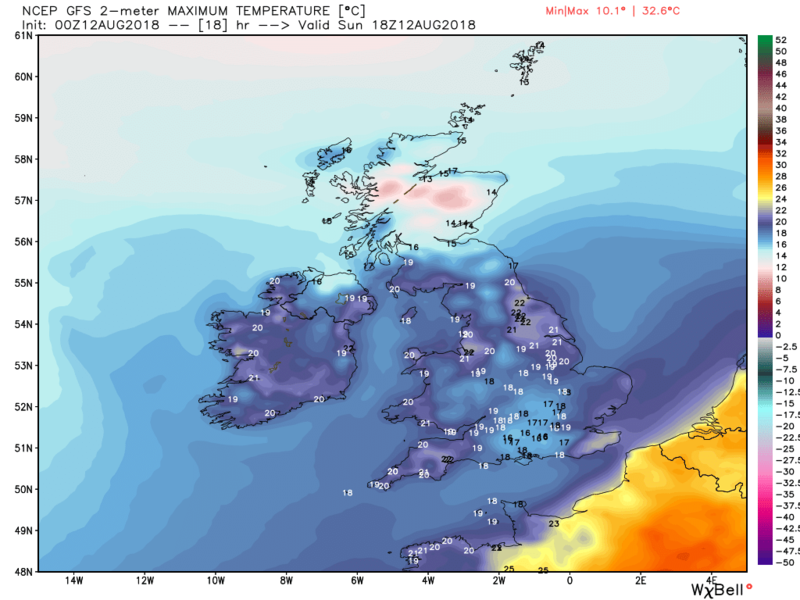 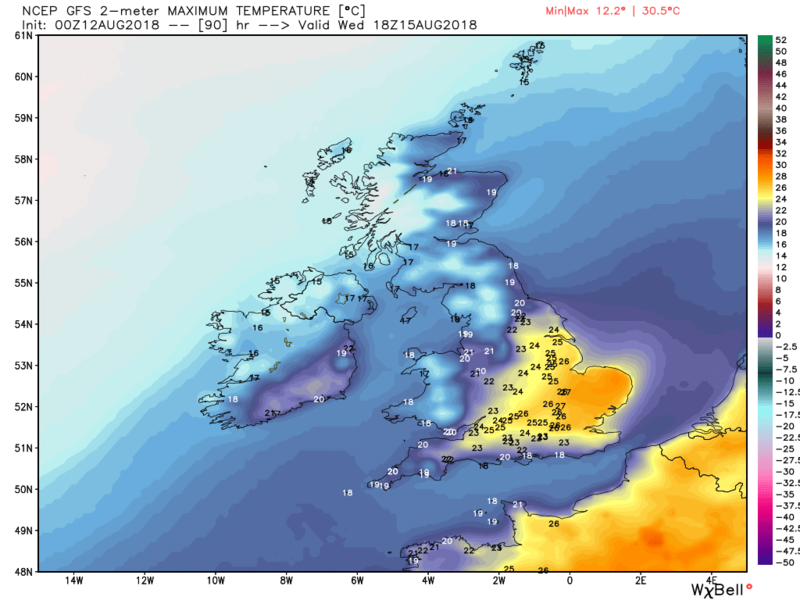 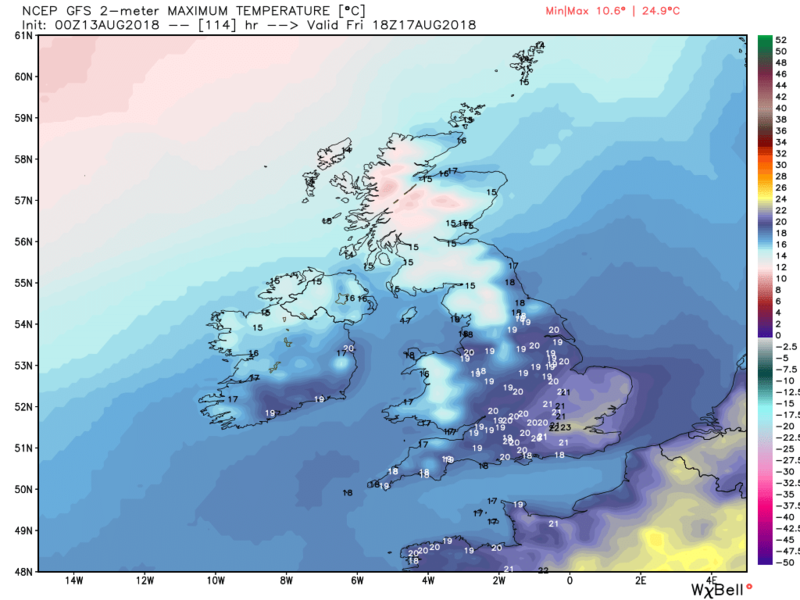 Not a particularly pleasant night and tomorrow in prospect as the whole caboodle tracks north east across most of the country, albeit dragging some warmer air with it. 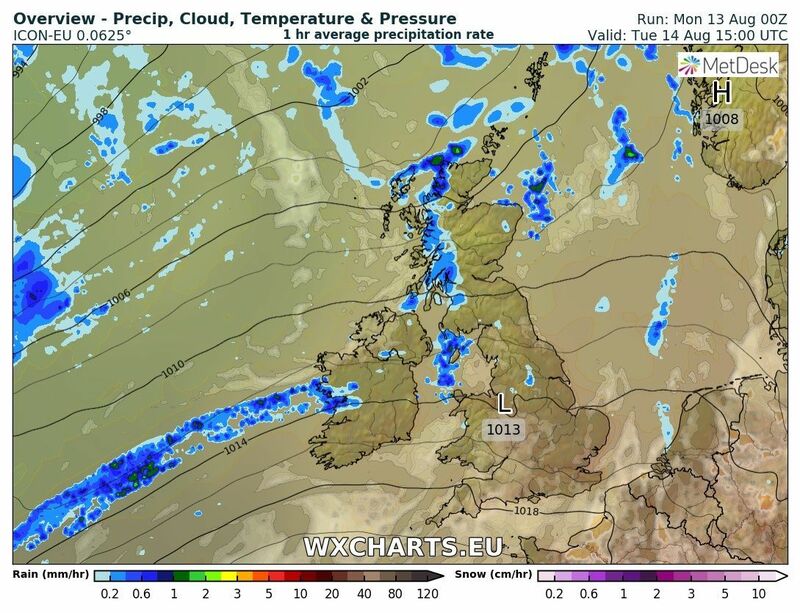 A clearence in the south west and west Wales in the morning as the cold front clears. 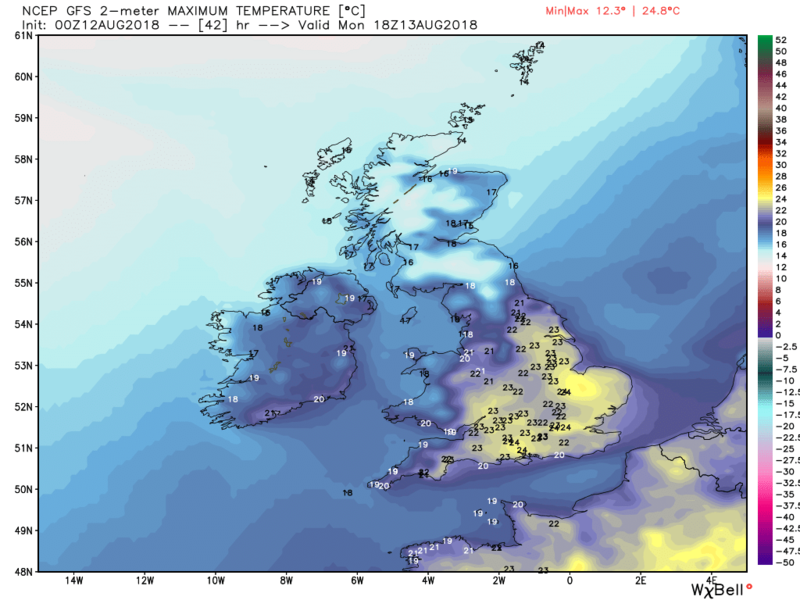 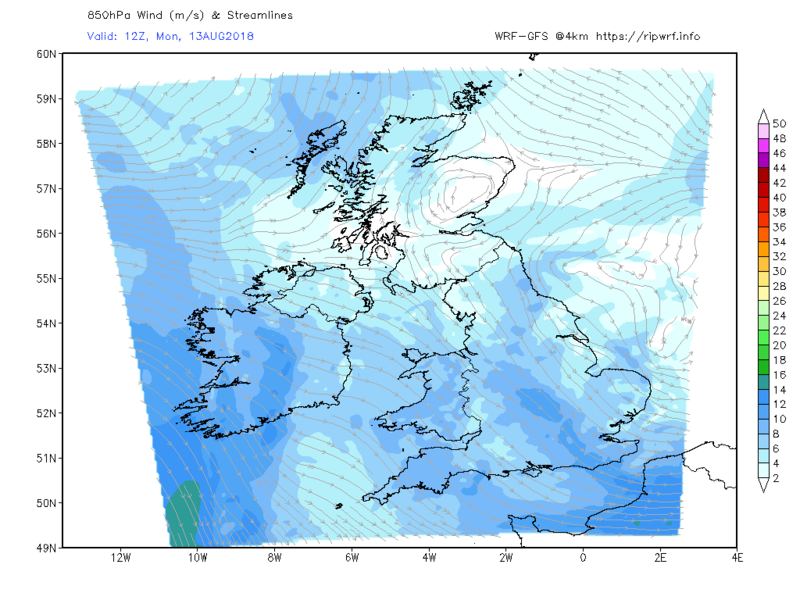 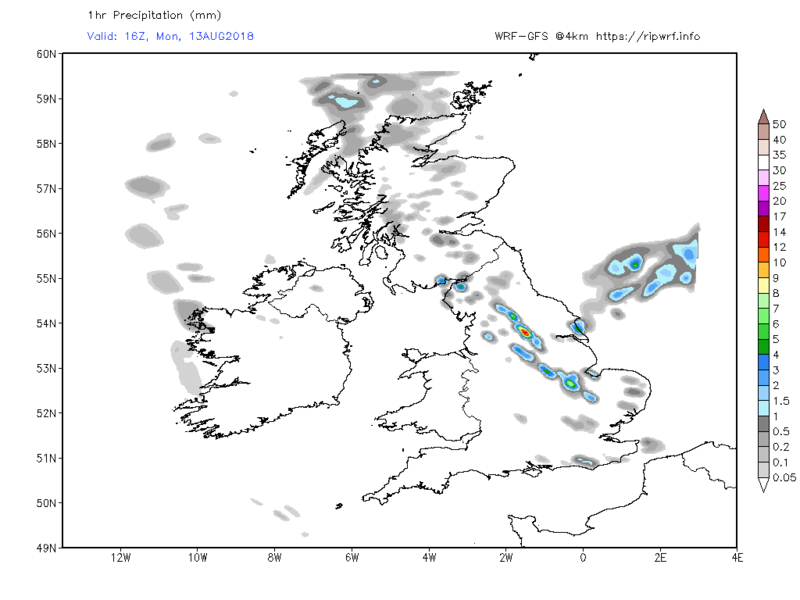 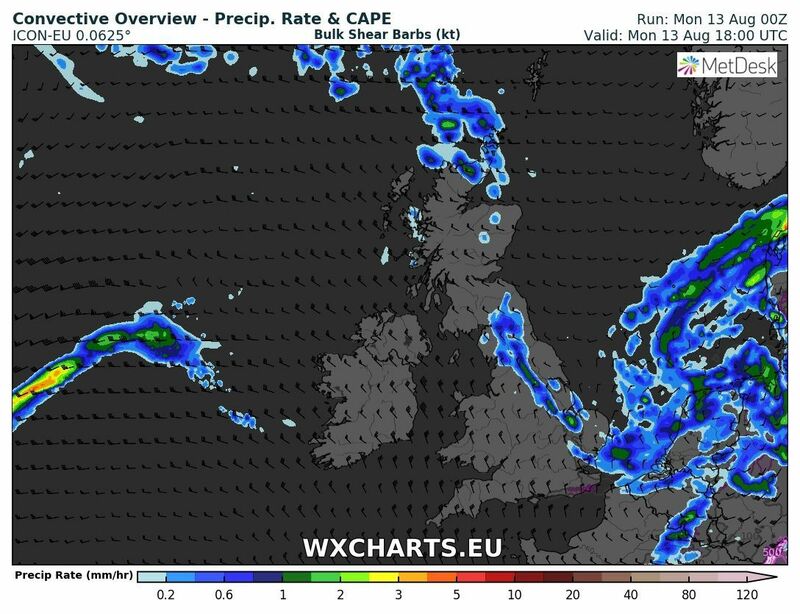 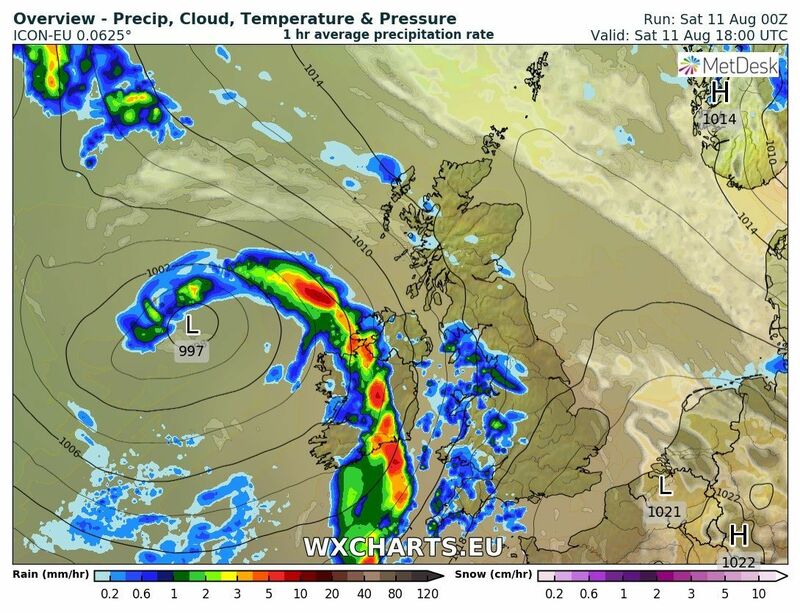 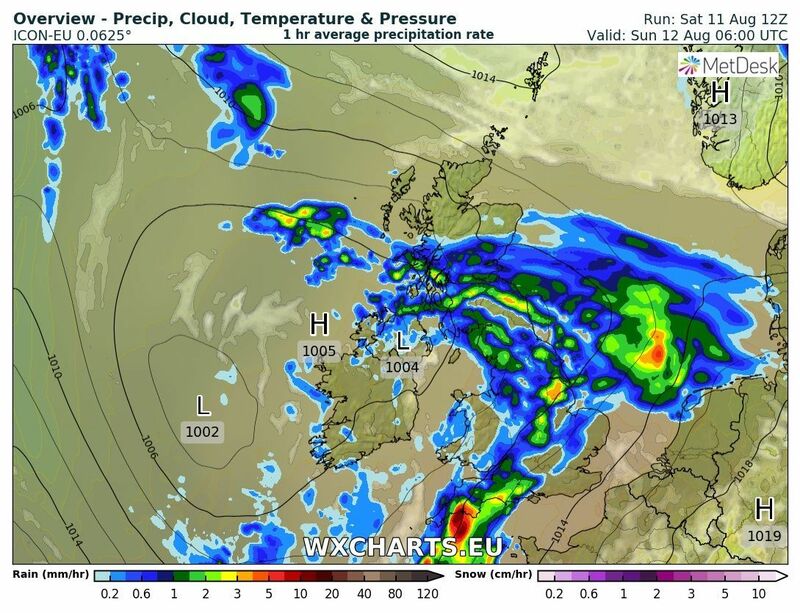 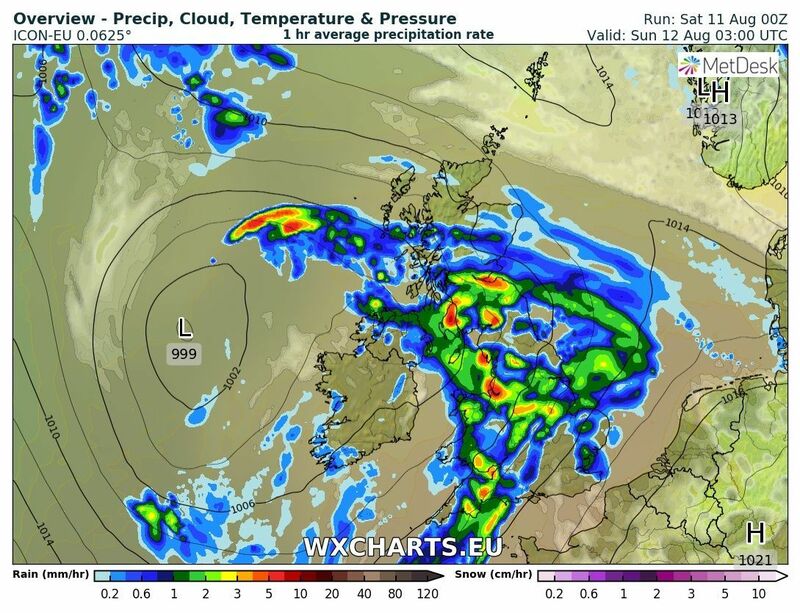 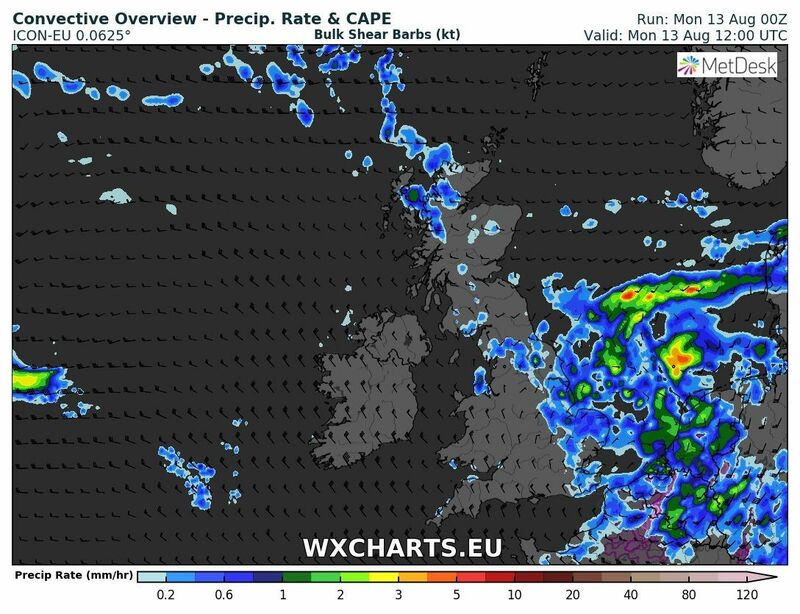 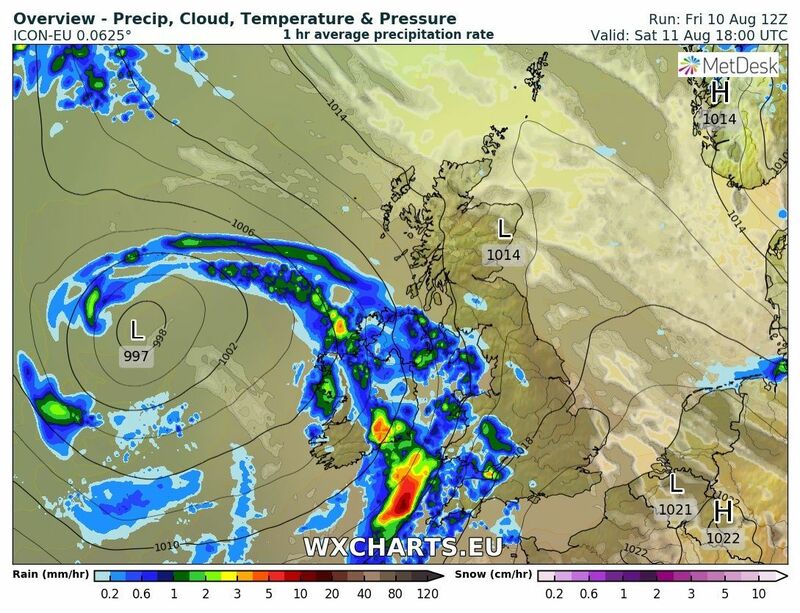 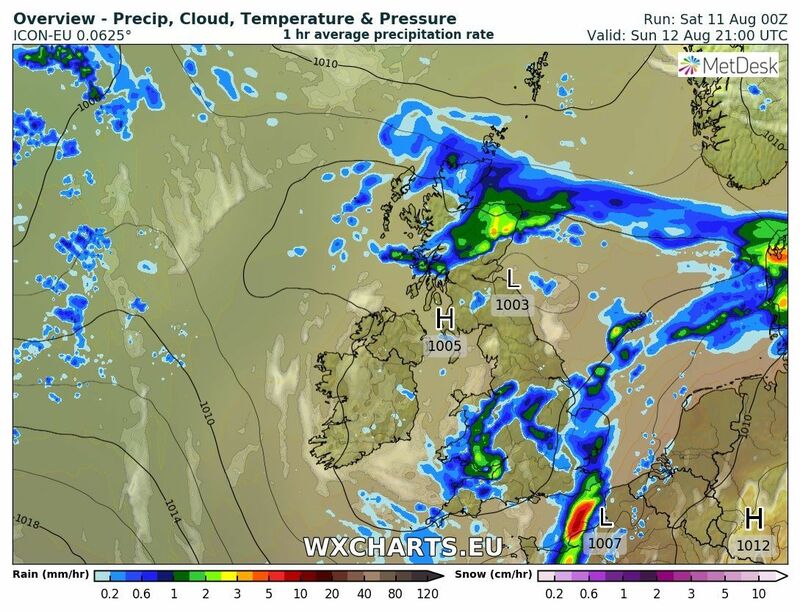 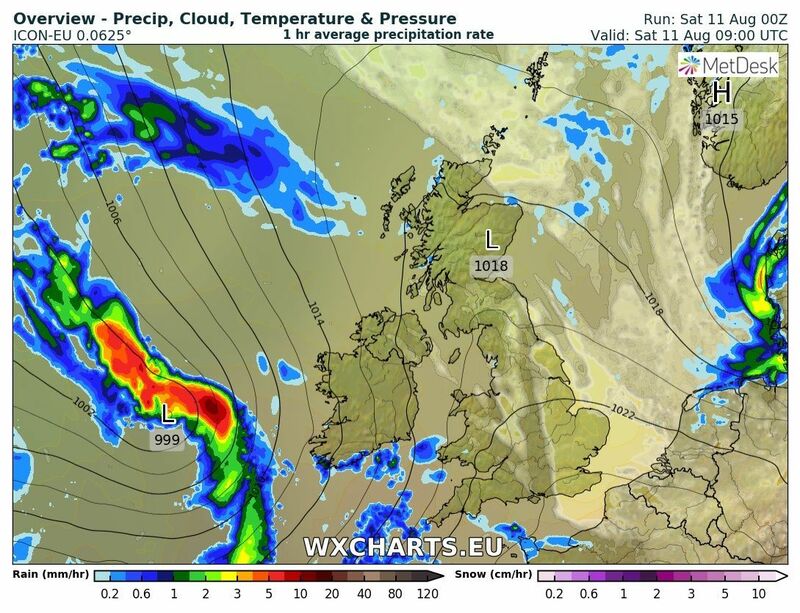 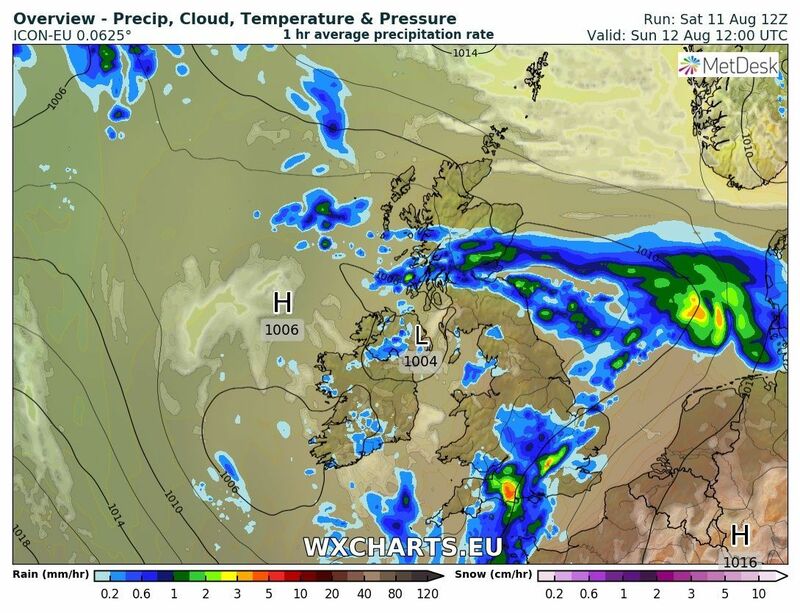 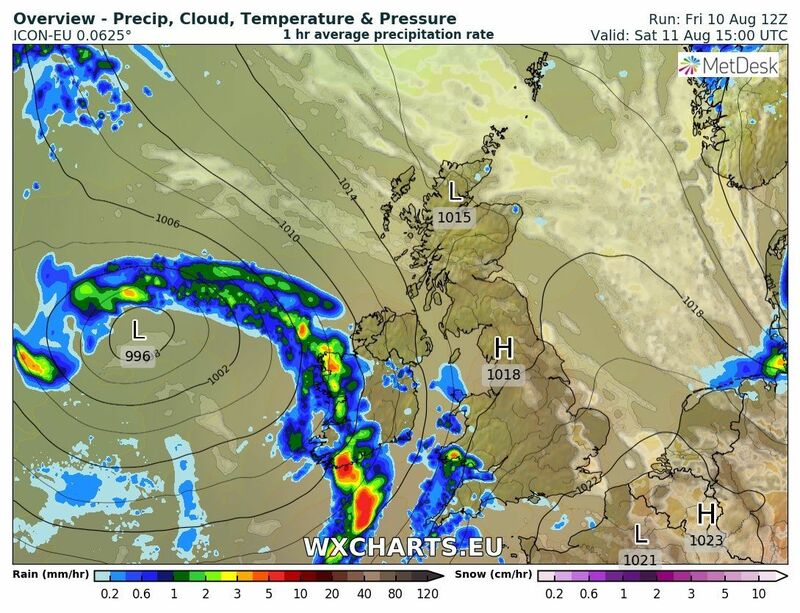 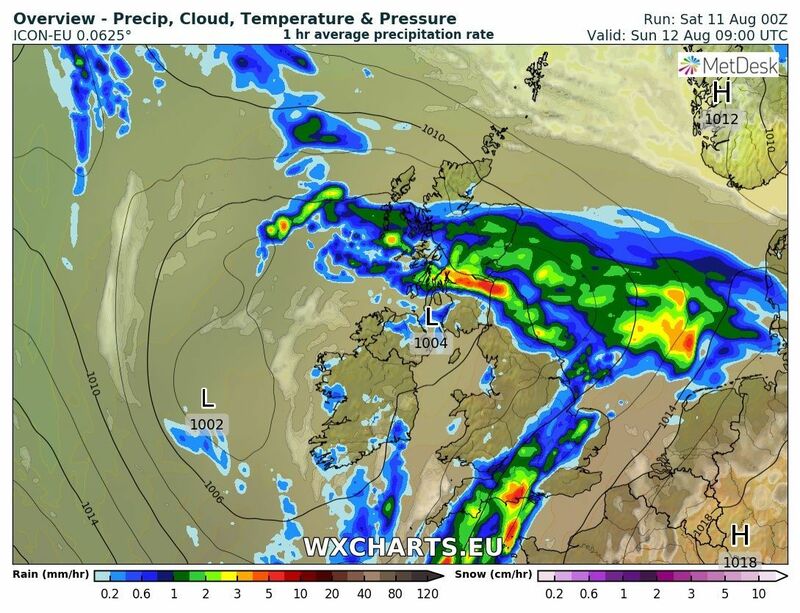 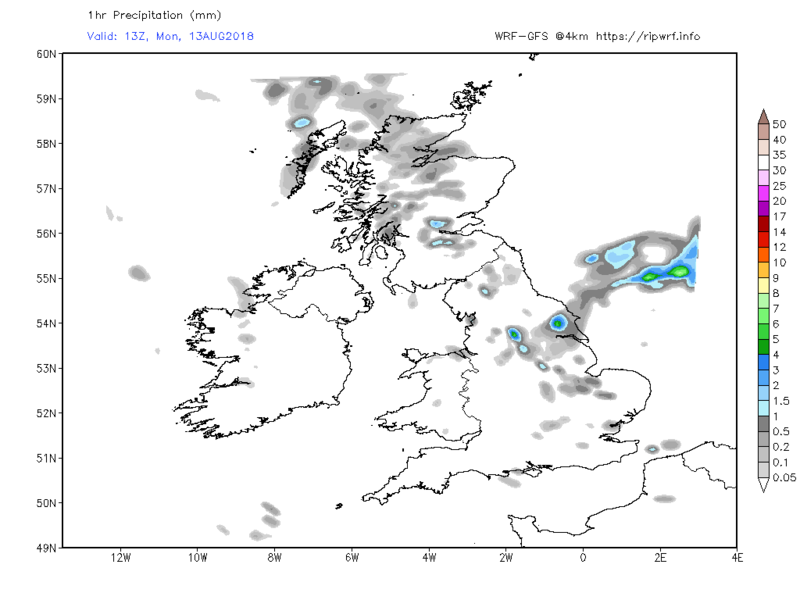 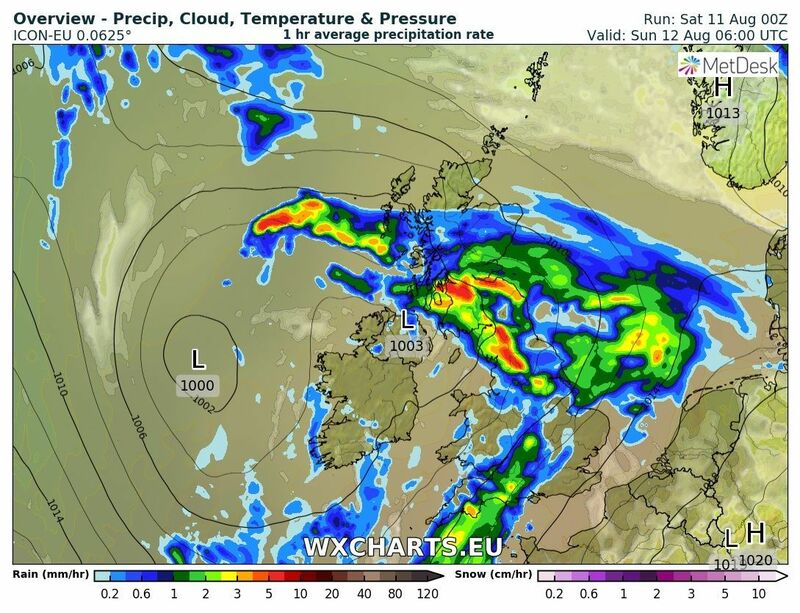 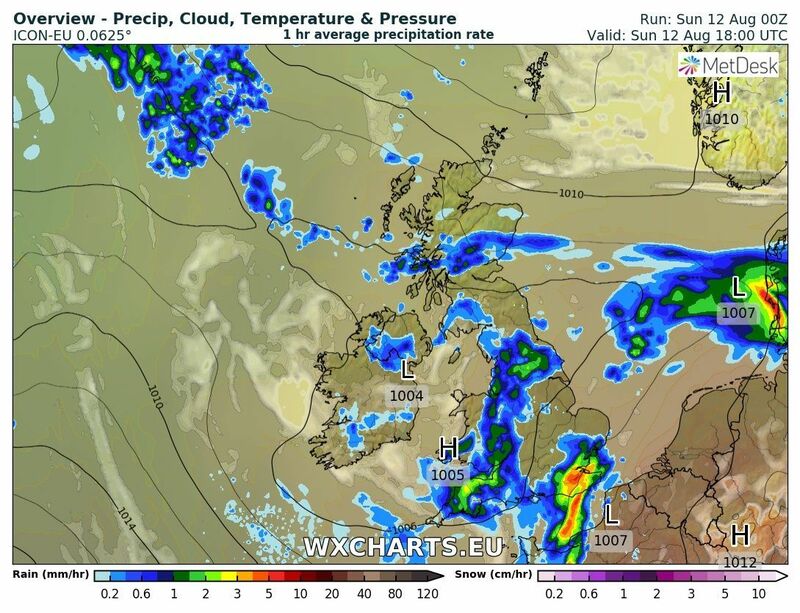 Possible thundery activity on the front tomorrow PM? 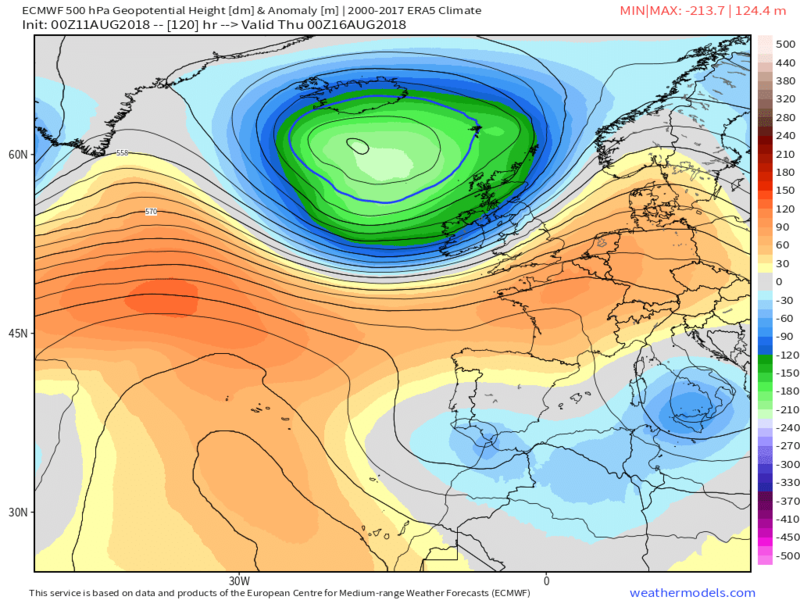 Outlook: Remaining unsettled but with the airstream periodically sourced from the south west, some warmer weather infiltrates the south. 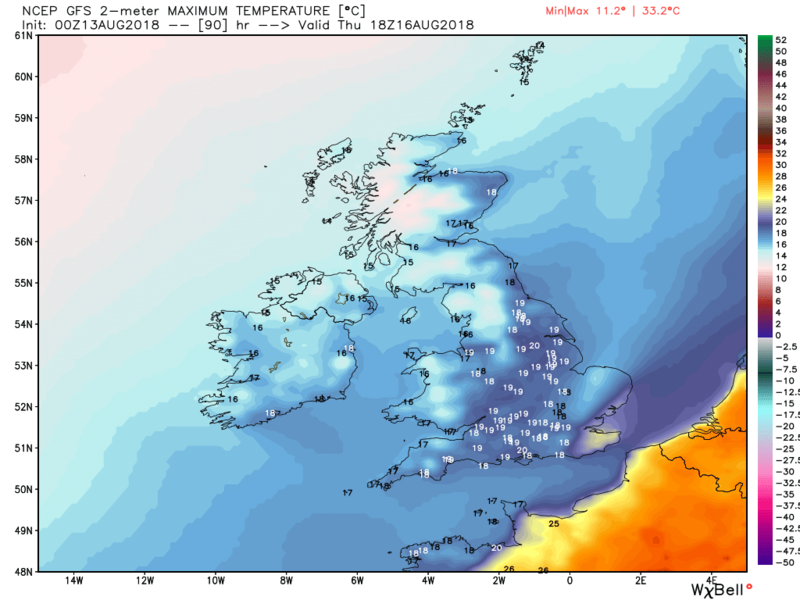 The current NH profile. 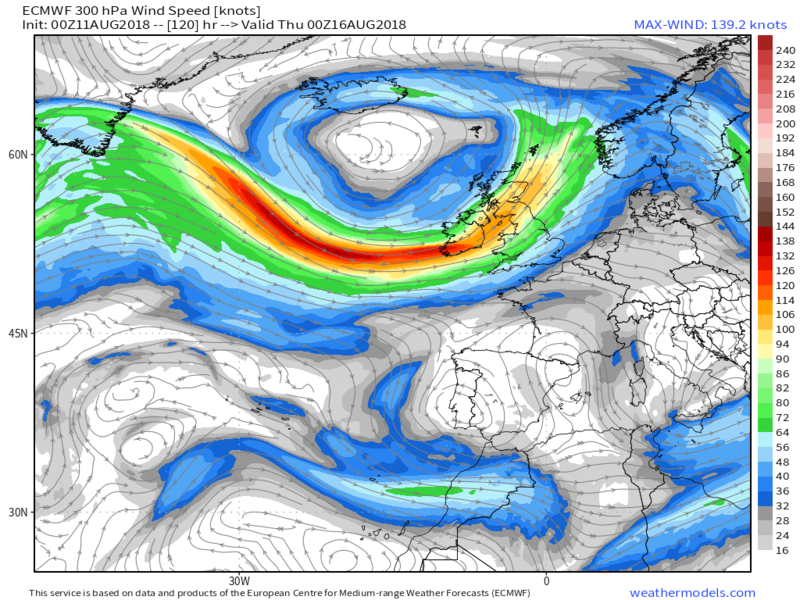 Needless to say it has been a wet and breezy night in many areas thanks to a filling low over Ireland and the associated fronts traversing the country. 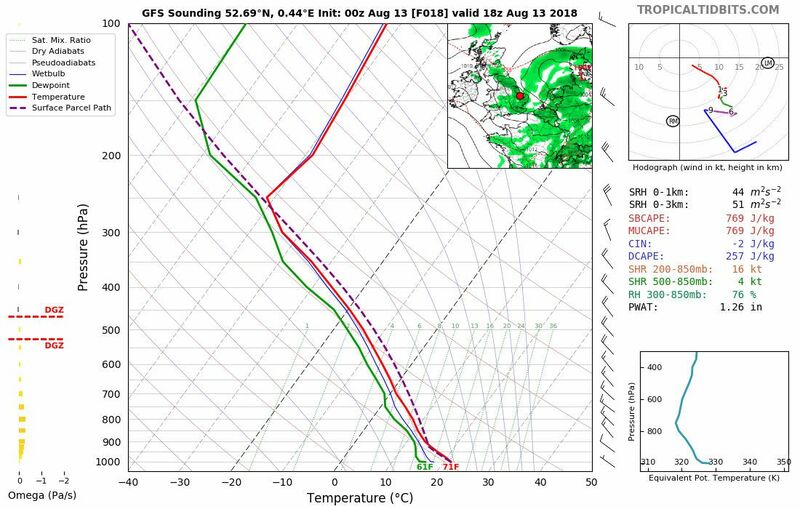 And if you want an example of what a sounding profile looks like in such a scenario look no further than the Camborne 00 sounding. 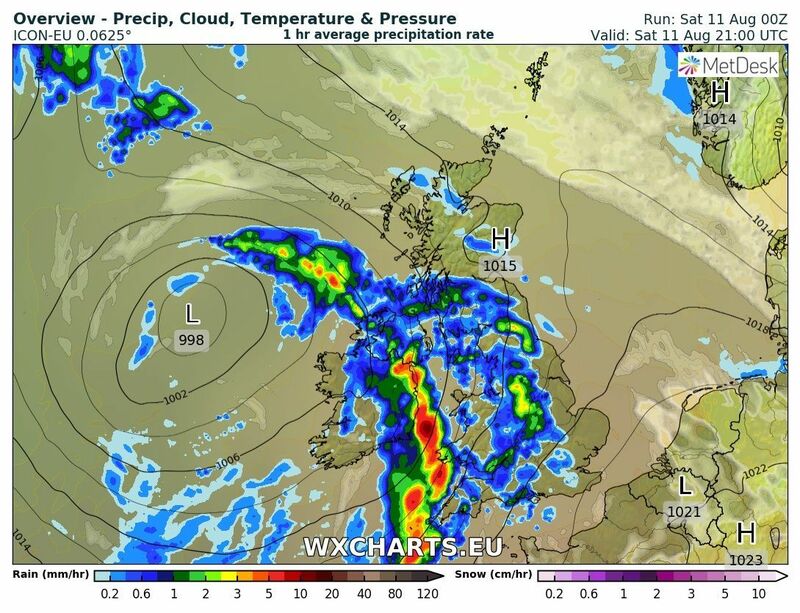 Te main band of rain from the warm front is currently straddling the north and the the cold front passed through here quite recently The main rain today over England, with some heavy outbursts, will come from the latter as it moves east with the added complication of a wave forming on it. 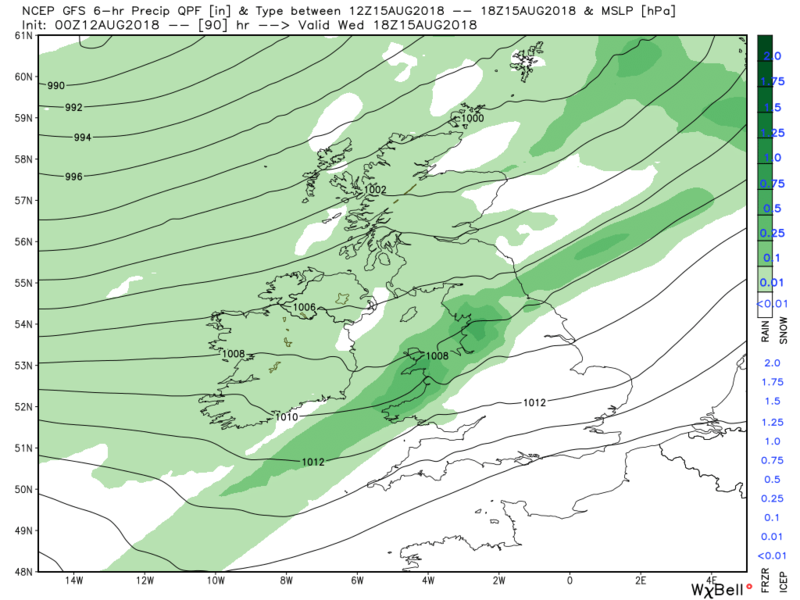 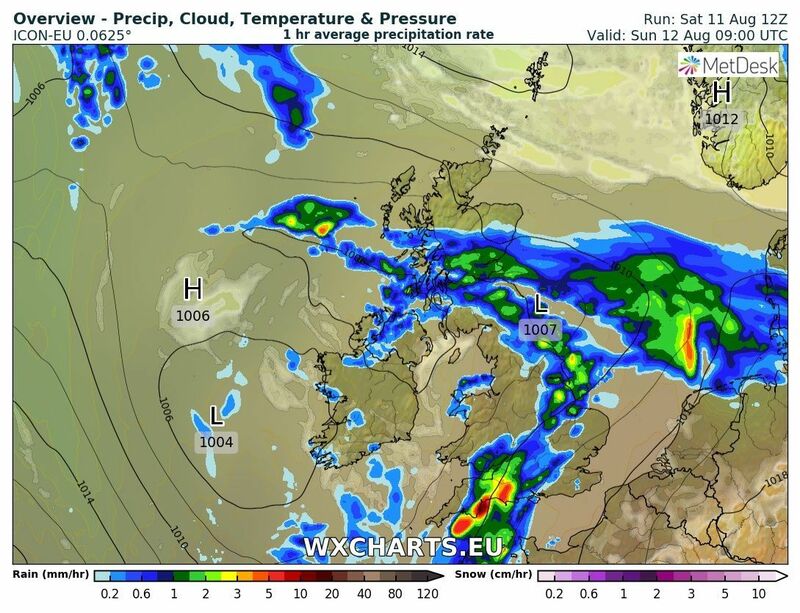 As the front passels it will clear in the west but in the very moist atmosphere a little heating could well set off some quite intense thundery showers. 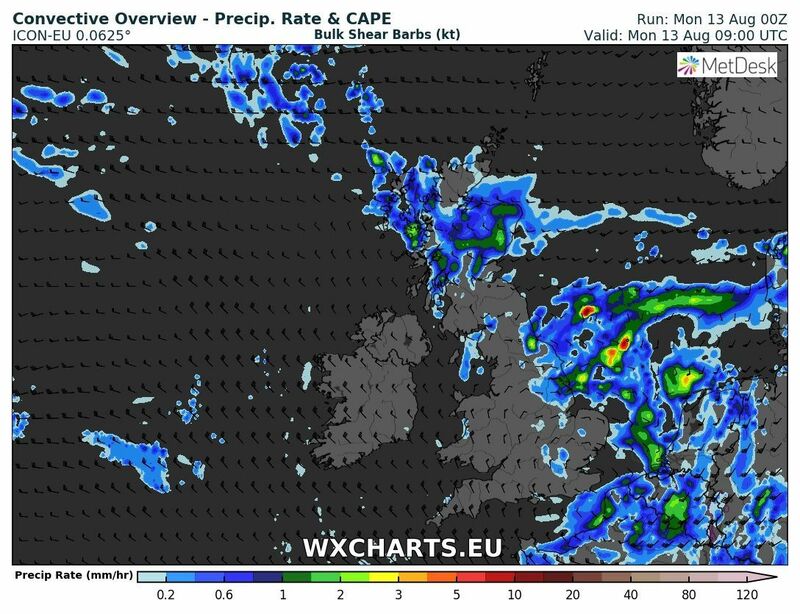 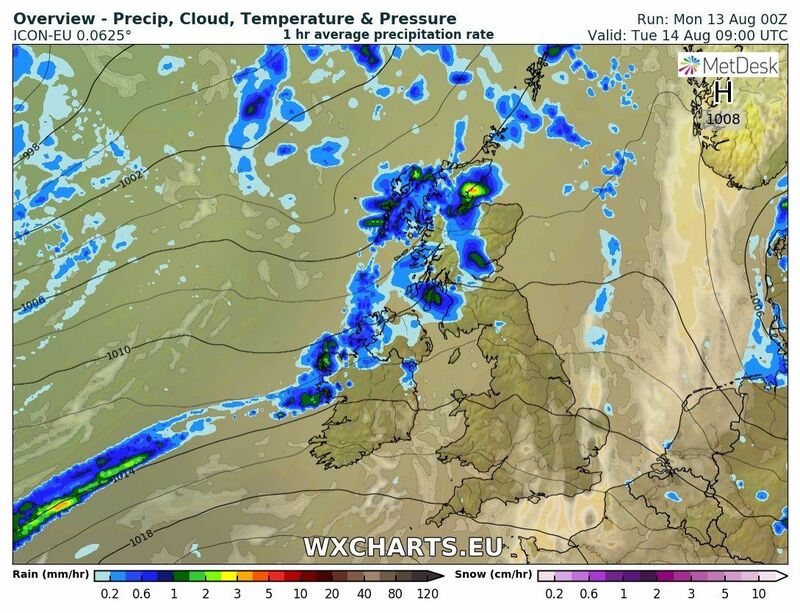 The thundery showers will continue through the evening but dissipating overnight and through Monday portending quite a pleasant day in the west, although showers will continue to effect N. Ireland and Scotland. 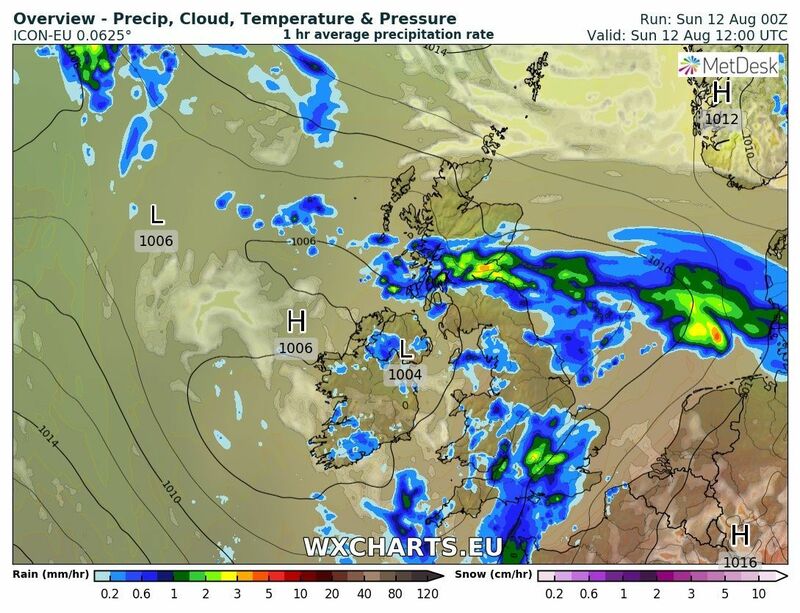 Elsewhere the frontal rain will be quite slow to clear the east and it's not until the early afternoon that the shallow low is in the North Sea. 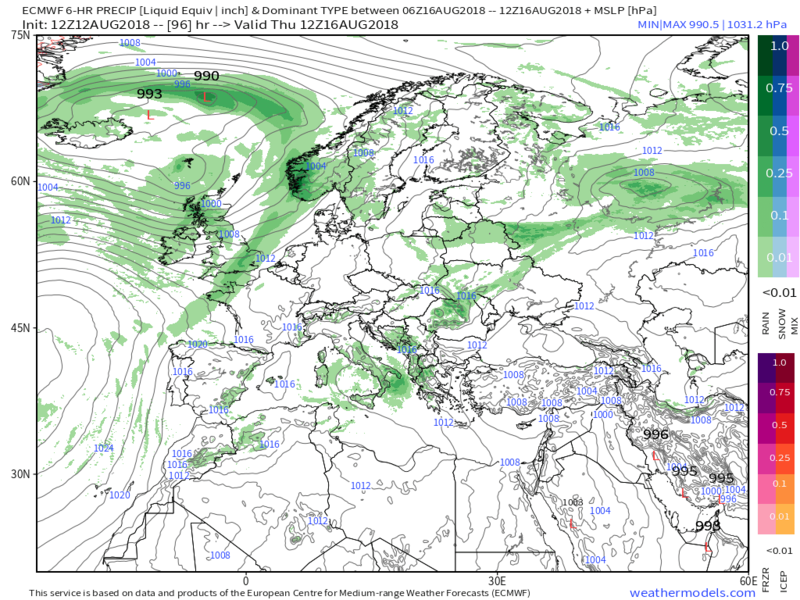 And on Tuesday with the ridge influencing the south some dry and warm weather here as frontal systems, with cloud and patchy rain , running around the northern flank and effecting N. Ireland and Scotland. 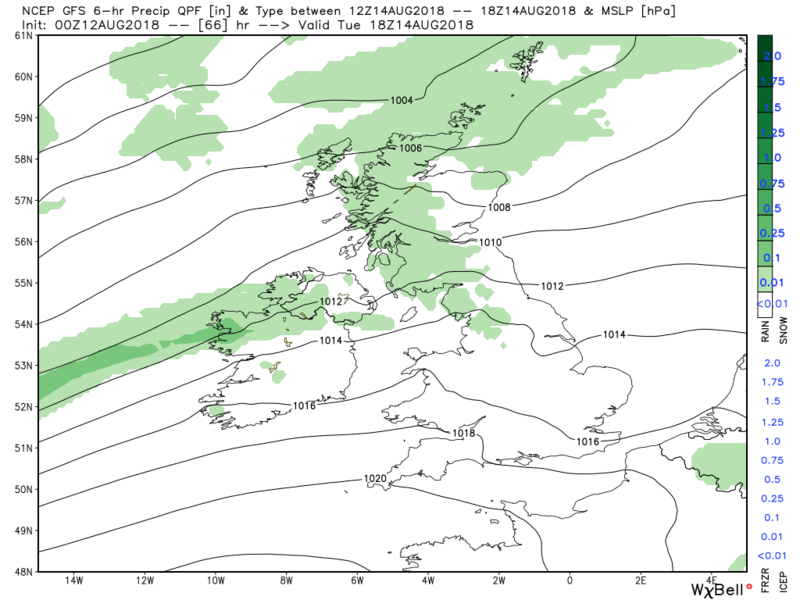 exerting pressure on the ridge and the surface fronts associated with this are bringing cloud and rain, along with a freshening wind to the north western half of the country. 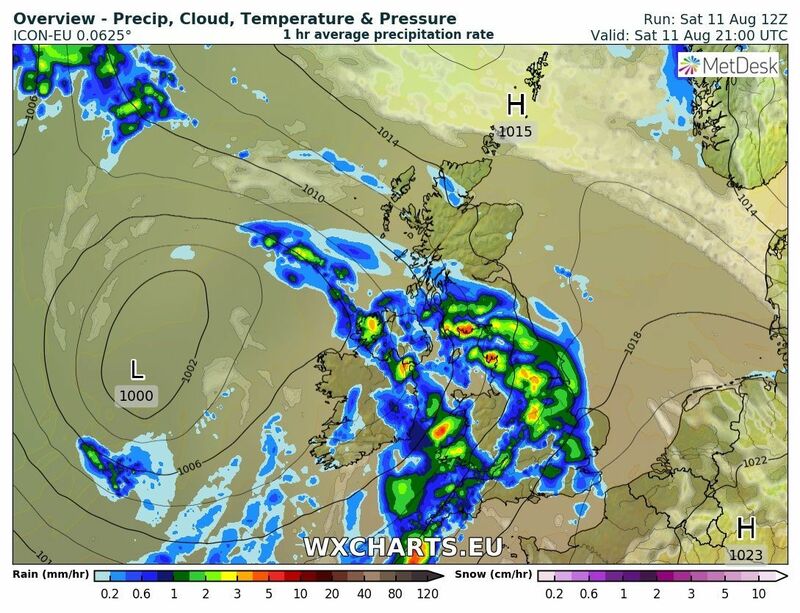 The aforementioned fronts will track south east on Thursday bringing patchy rain and cooler conditions to all. 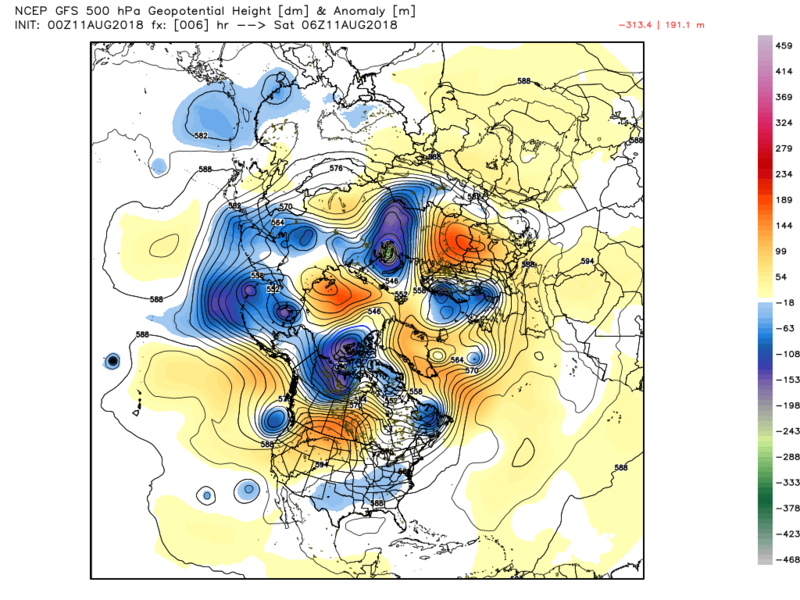 An overview of where we are at the moment looking at the 1200 analysis and 1500 geo. 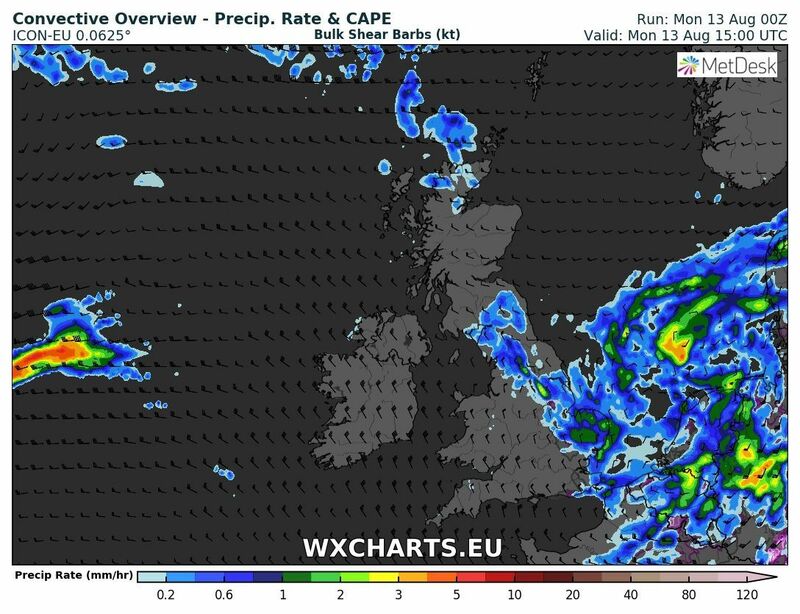 Tomorrow one wave feature over northern Scotland is forecast to slip south east into the north Sea only to be replaced by another. 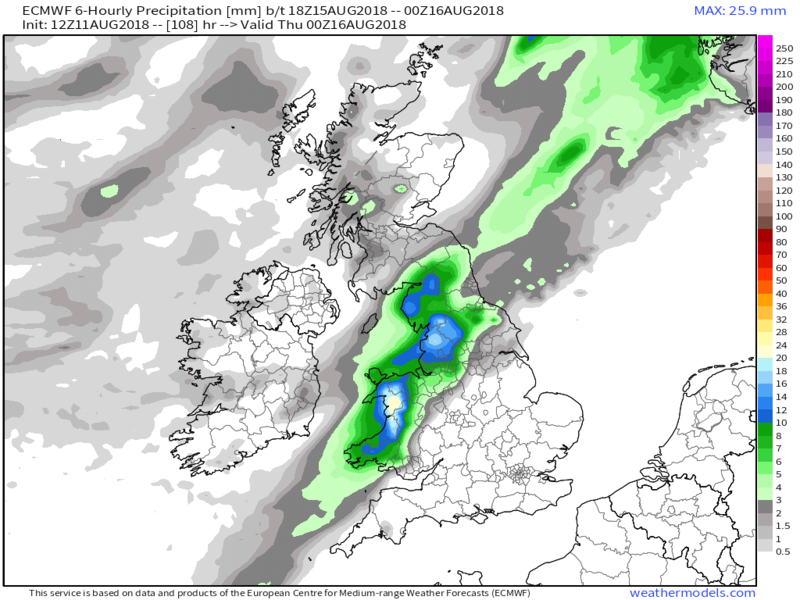 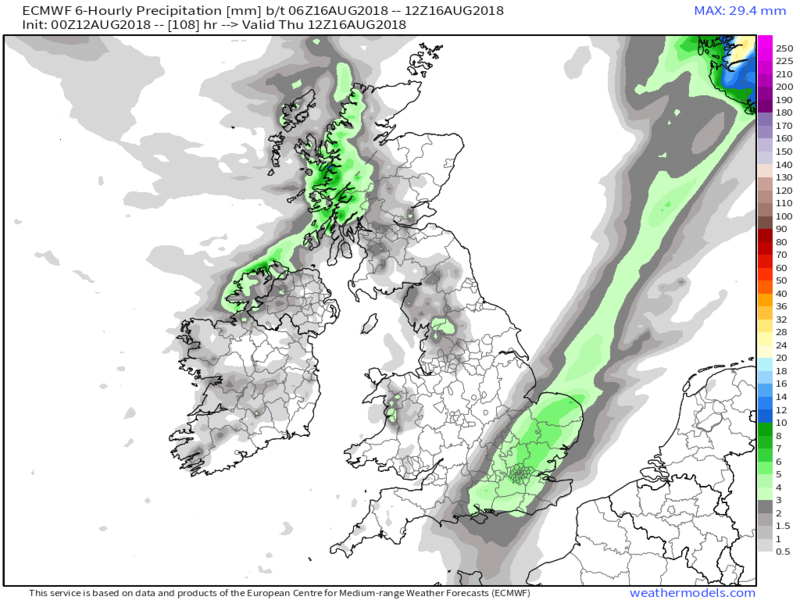 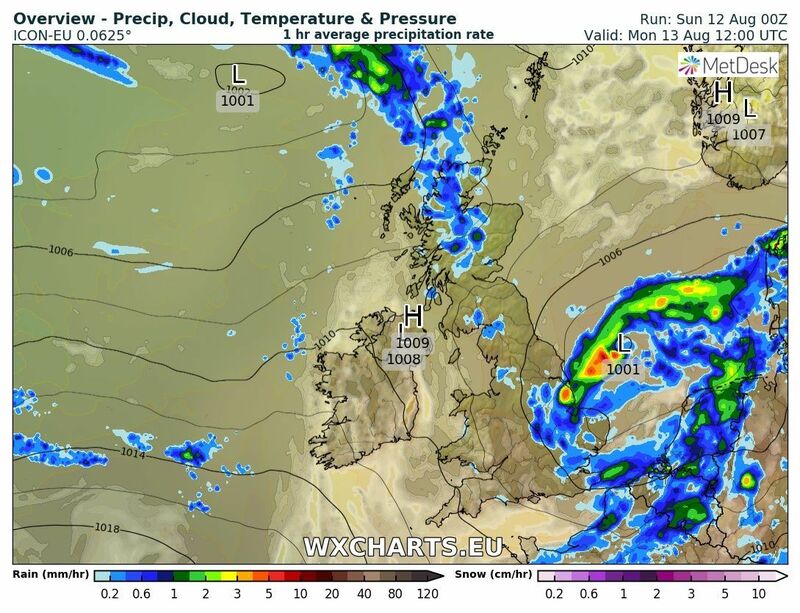 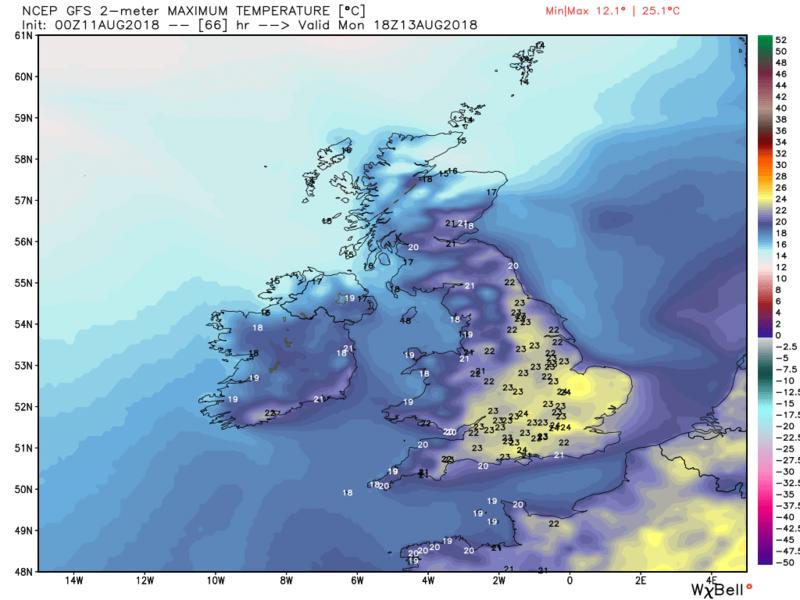 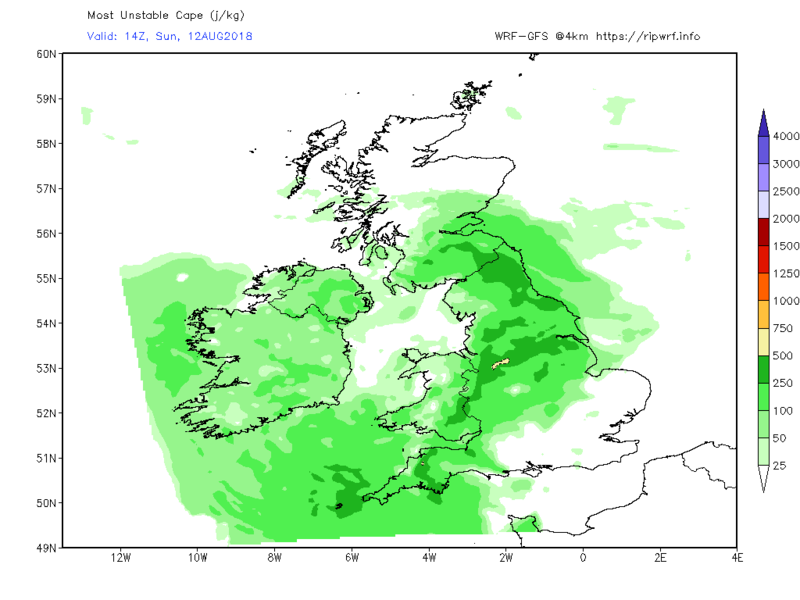 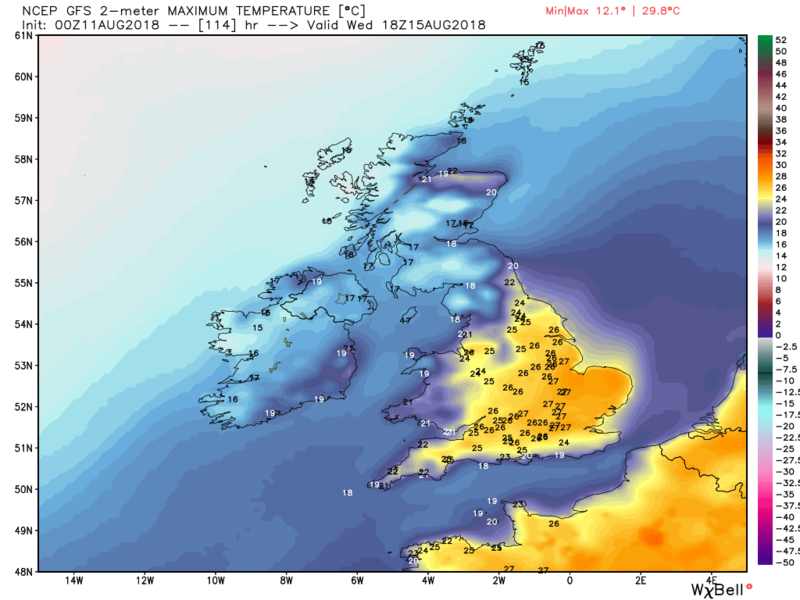 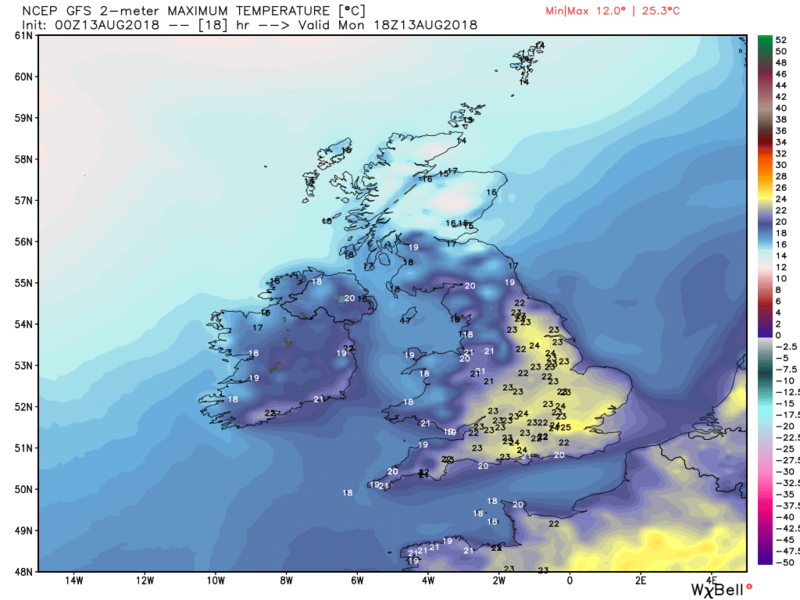 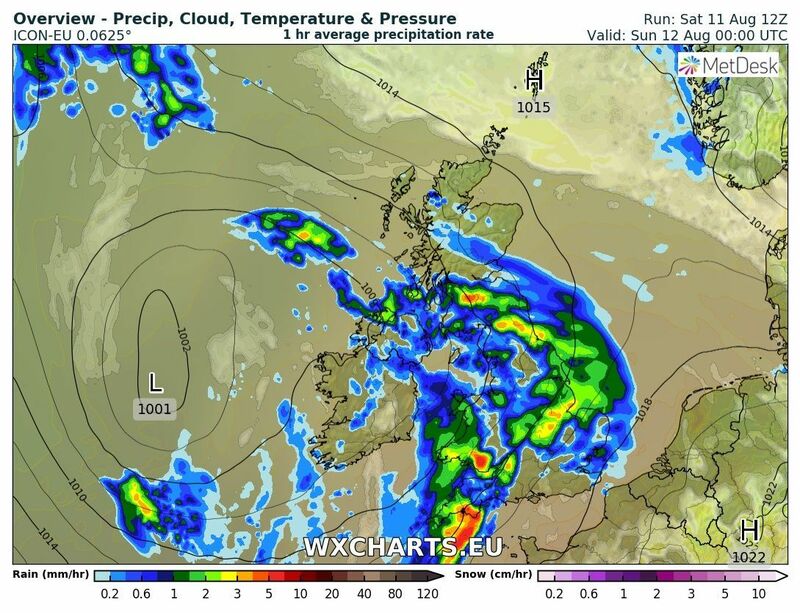 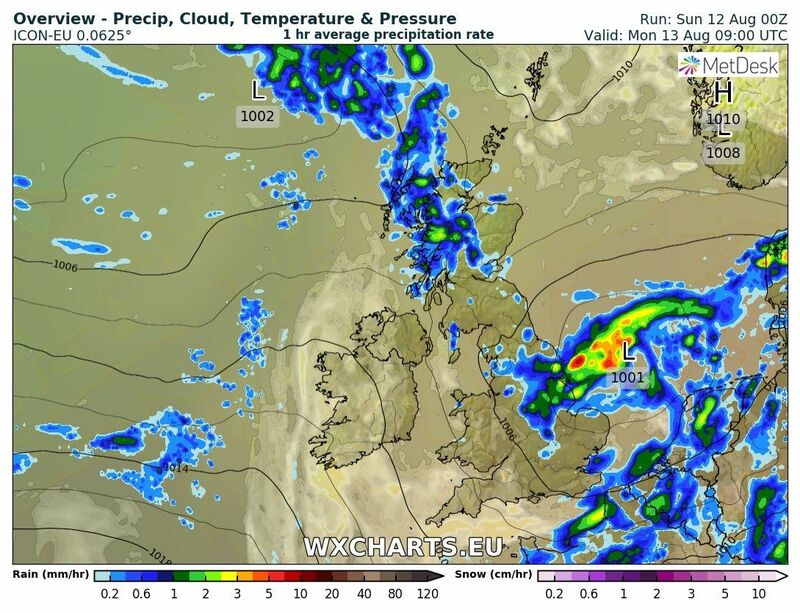 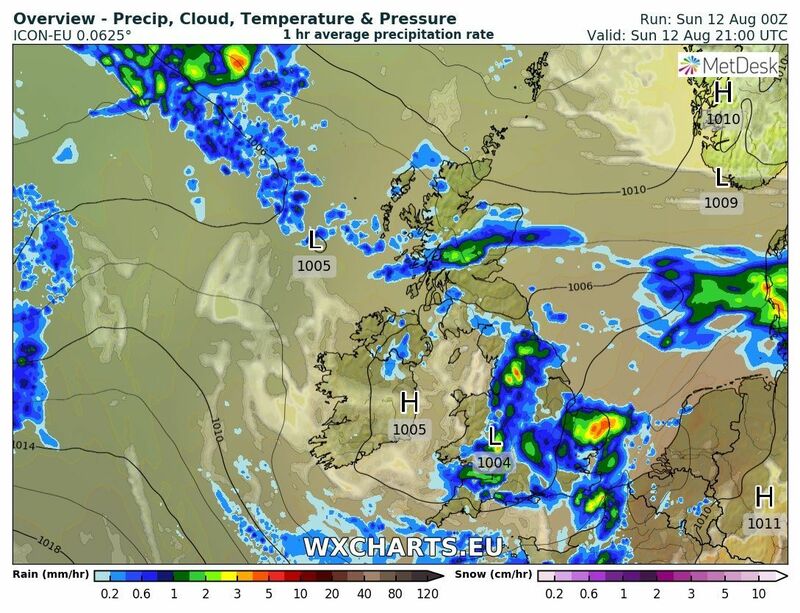 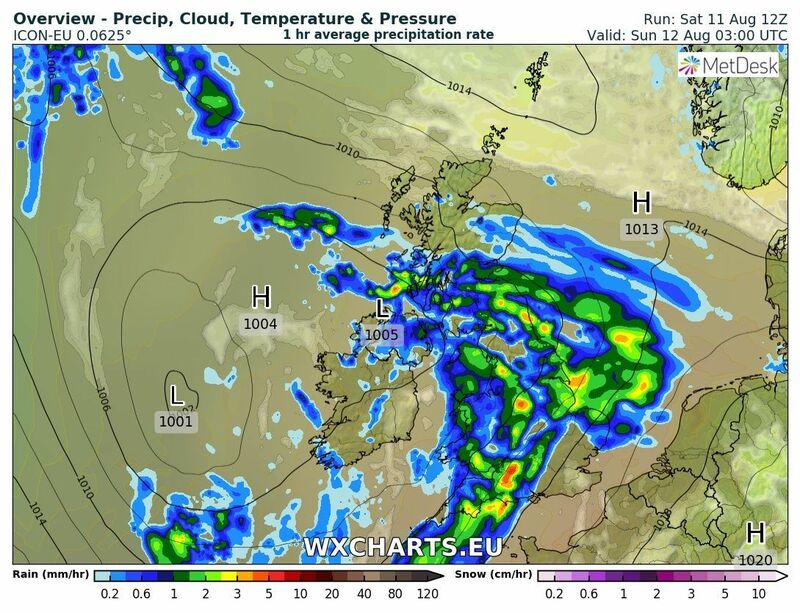 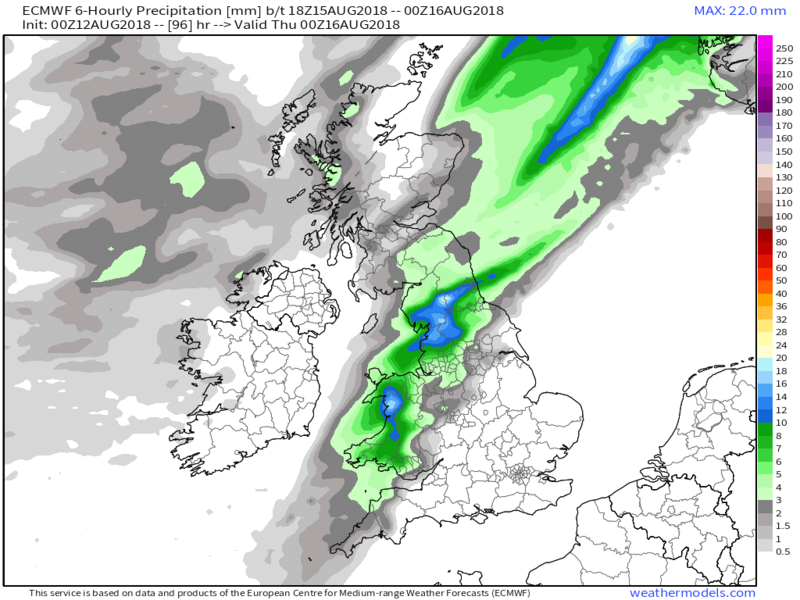 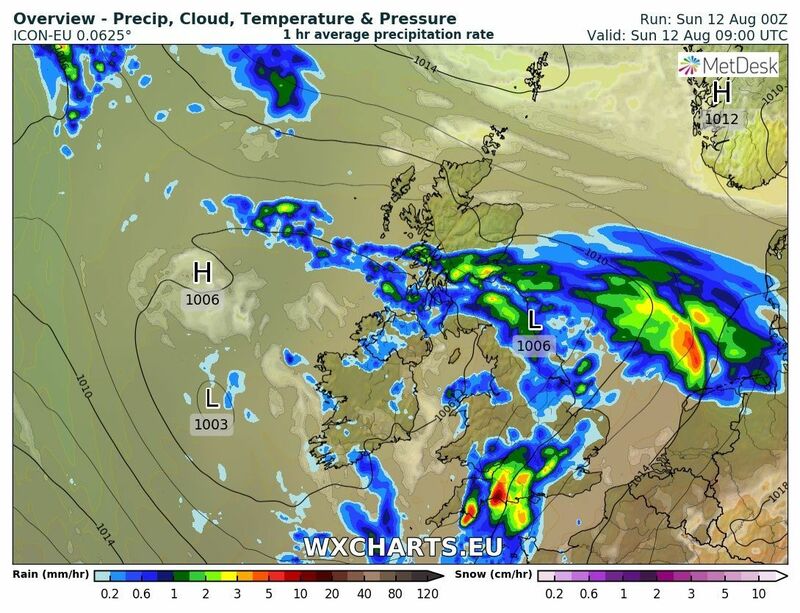 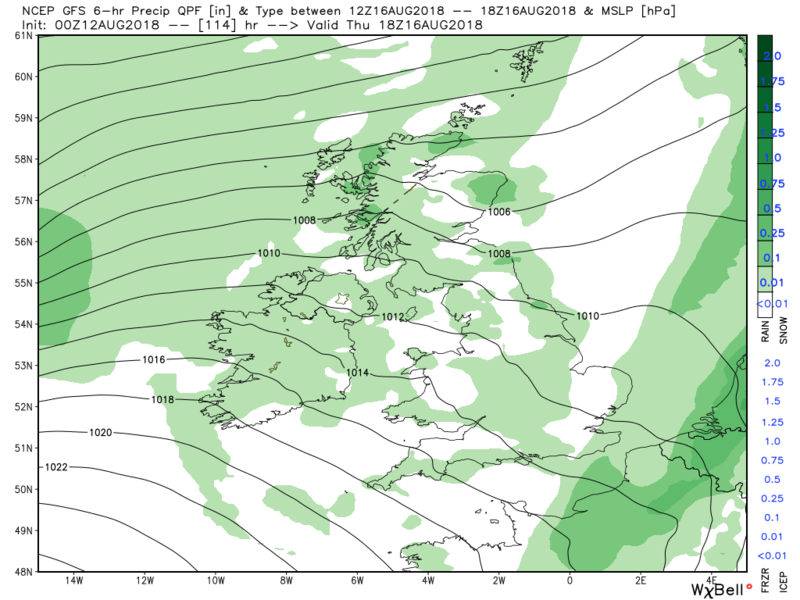 Thus cloudy with outbreaks of rain in the former area and the distinct possibility of some thundery outbreaks over north east/eastern England during the afternoon, Elsewhere cloudy with sunny intervals but clearer in the south west. 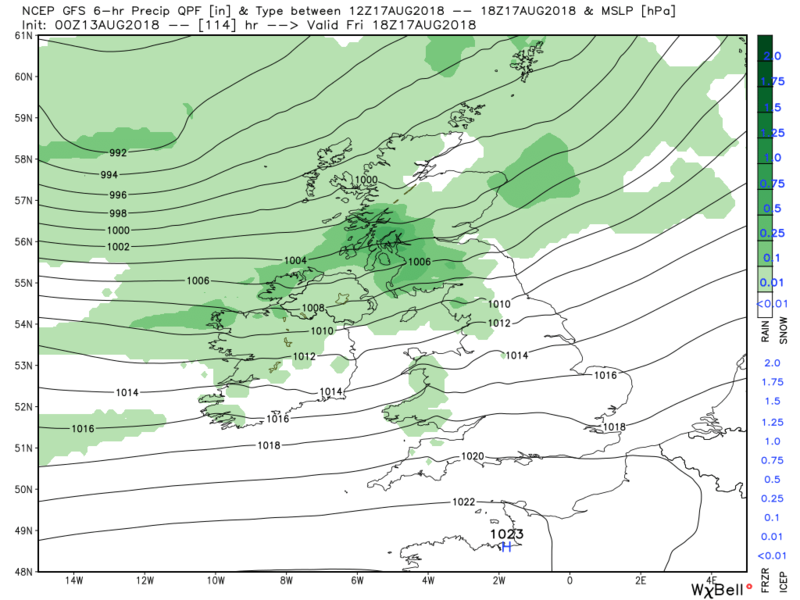 This evening's fax chart Weds 1200 and the ecm 1800/1200 charts Weds/Thurs/Frid showing the progress of the cold front and increasing surface wind ans arrival of the next system in the north. 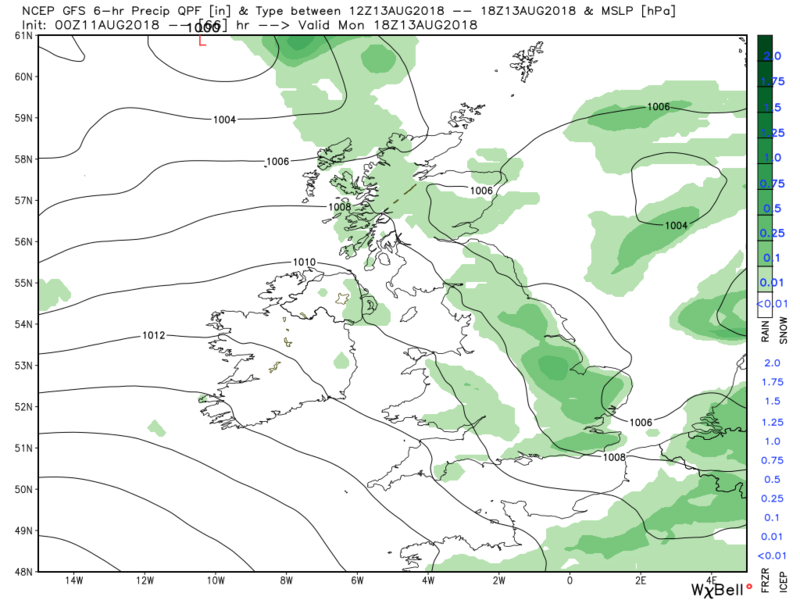 Outlook the same as yesterday which is unsettled that doesn't, within the fluid pattern,rule out spells of warmer and more humid weather encroaching the south. 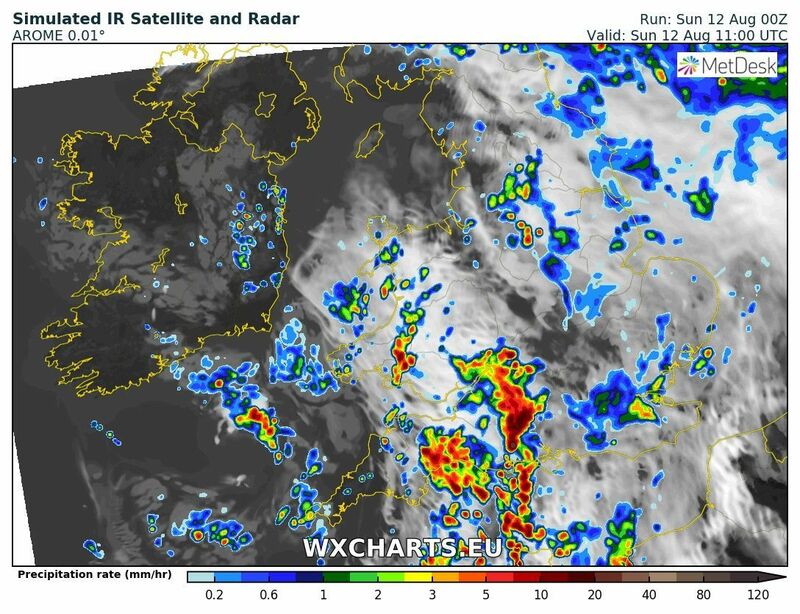 A fair bit of cloud around this morning, particularly over Scotland and N. Ireland and still lingering along the north eastern coast of England with some patchy rain. 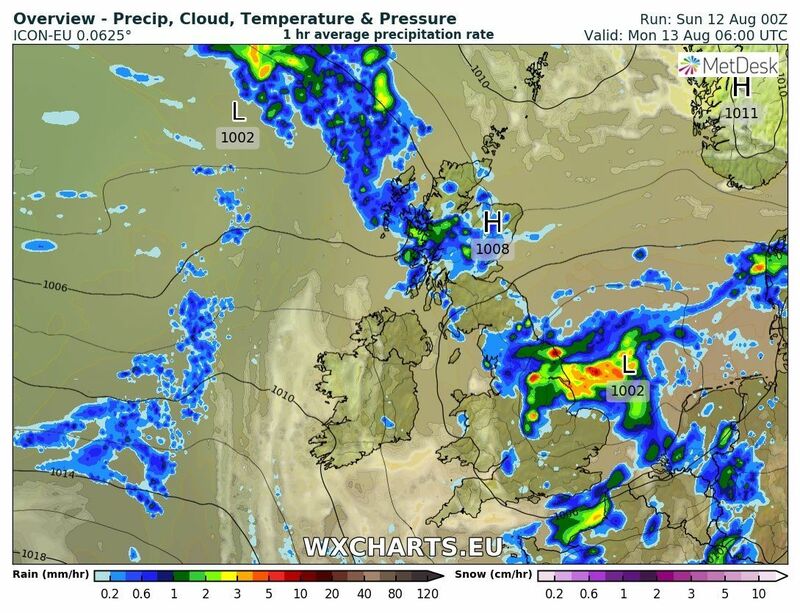 The cloud and patchy rain will persist today over Scotland but the cold front should move away from the east coast leaving much of N. Ireland, Wales and England in a showery regime with sunny spells, probably more of the latter in the south west, but during the afternoon and evening thundery outbreaks will occur in the north east/east of England within the convergence zone. 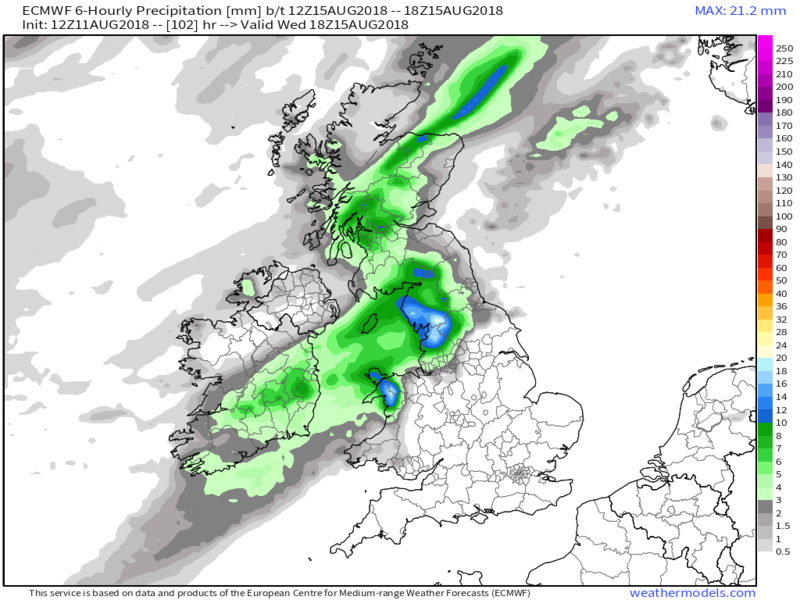 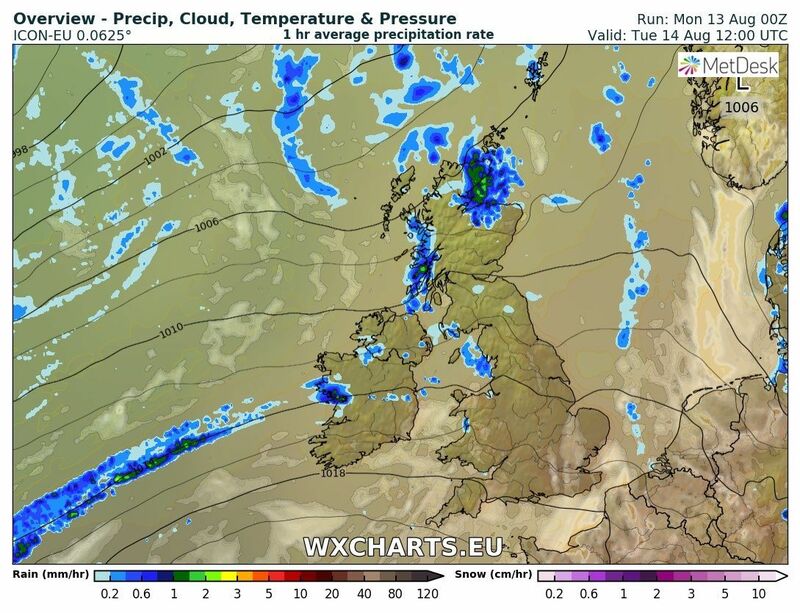 Overnight the showers will die away and the cloud and rain eventually leaving eastern Scotland as a ridge attempts to push in from the south west. 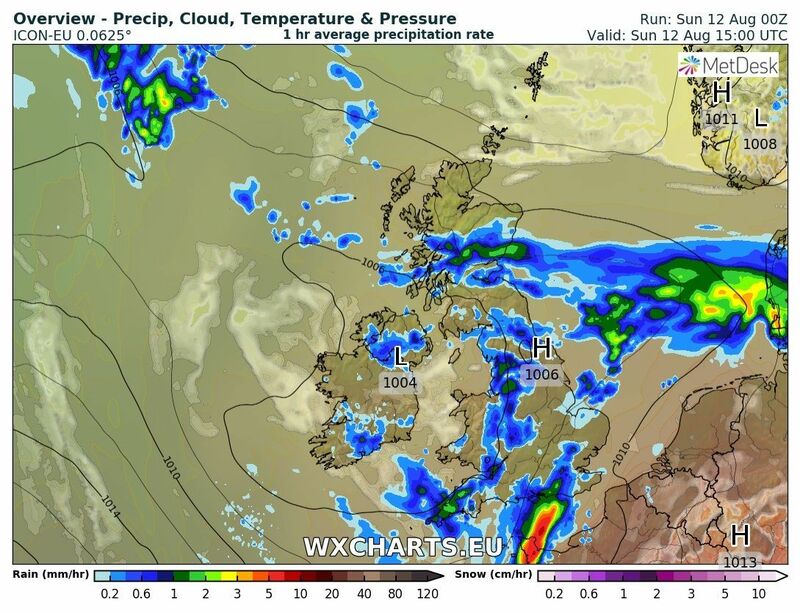 So generally a much drier and brighter start to the day on Tuesday with some of warmer air as mentioned earlier creeping into the south but a new frontal system approaching from the west quite quickly brings cloud and patchy rain into north western parts of the UK. 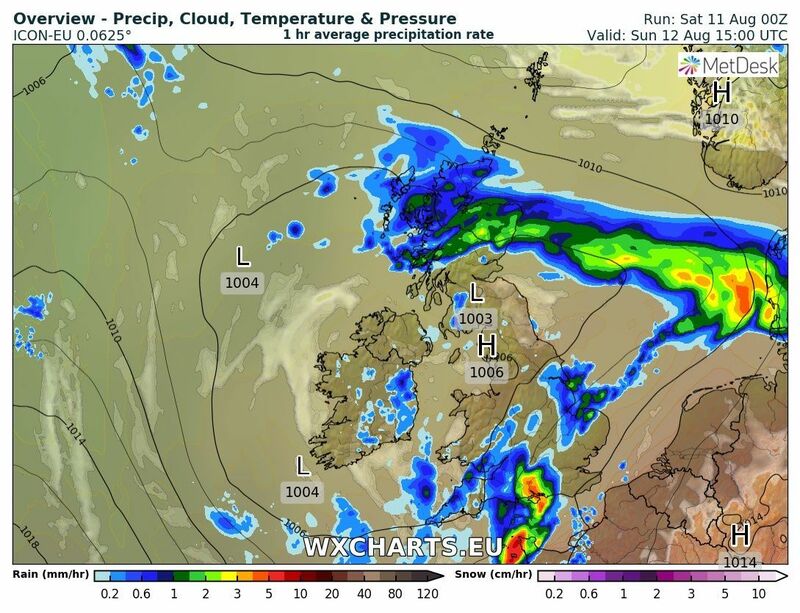 On the surface the NW/SE split continues with fronts bringing cloud, rain and strengthening winds into the former with the latter remaining dry and quite warm. 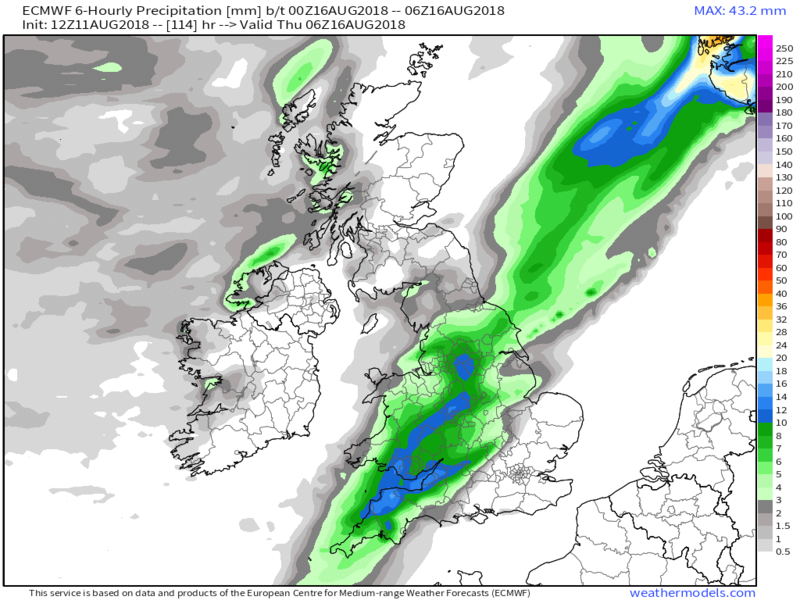 The cold front will continue to track south east, along with a band of rain, over the country overnight Weds and through Thursday introducing much cooler air to all and a showery regime in it's wake. 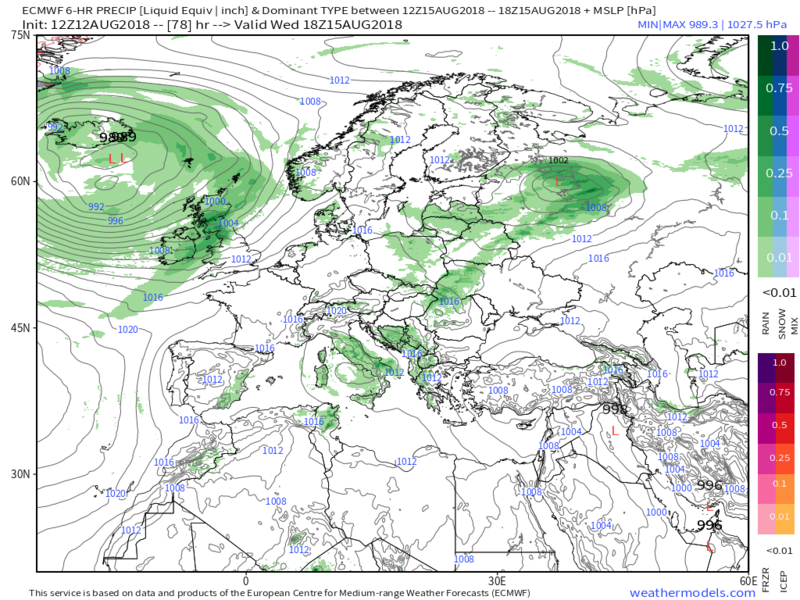 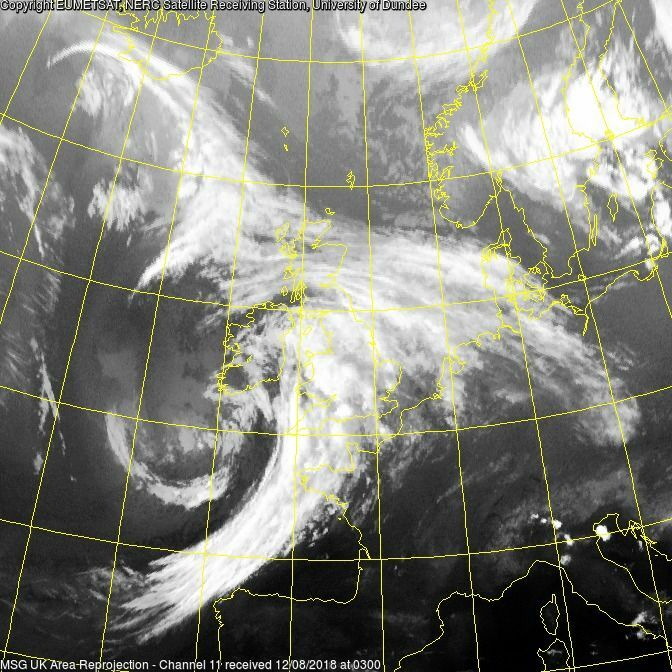 Friday will start dry but the next quite rapidly developing Atlantic low is tracking north east and is 982mb south east of Iceland by midday and the associated fronts have already brought cloud and rain, along with strengthening winds, into north western parts. 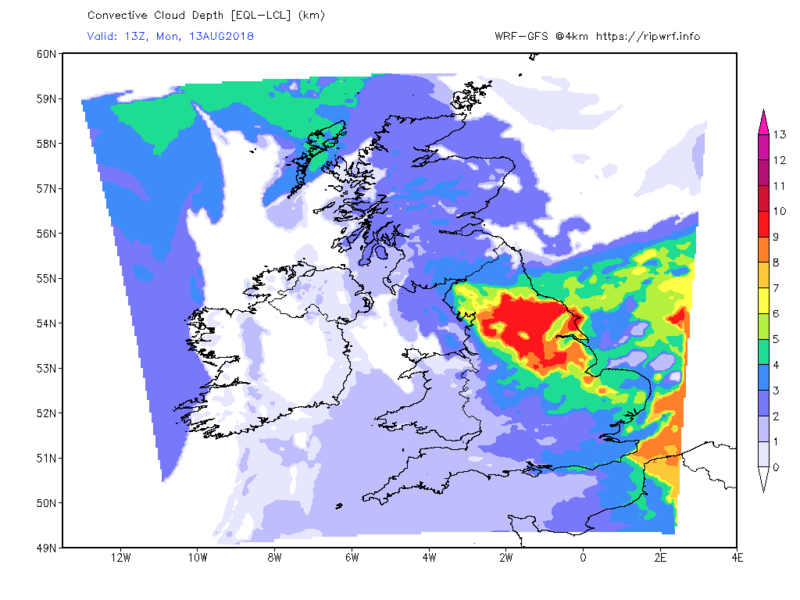 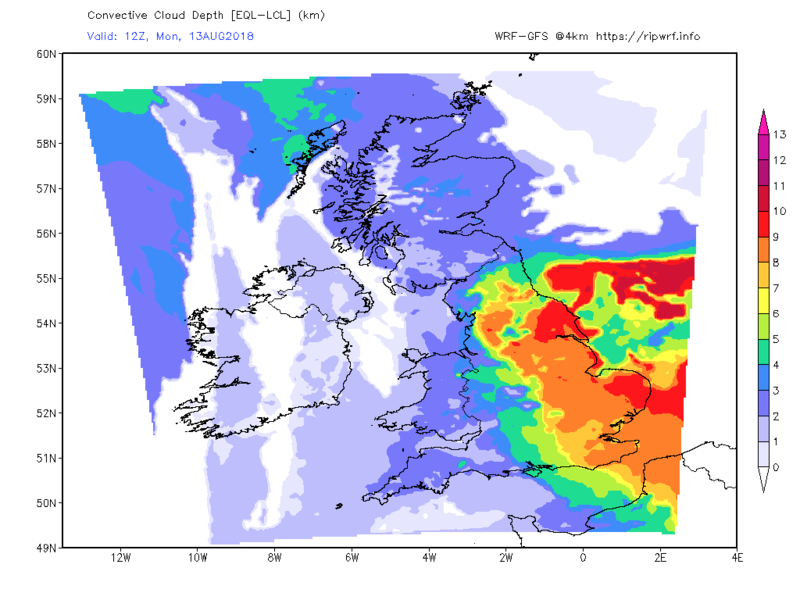 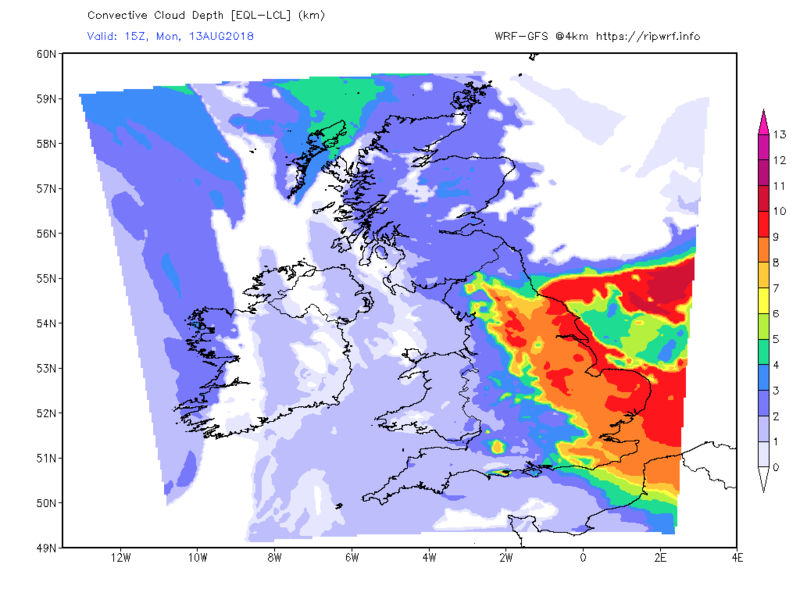 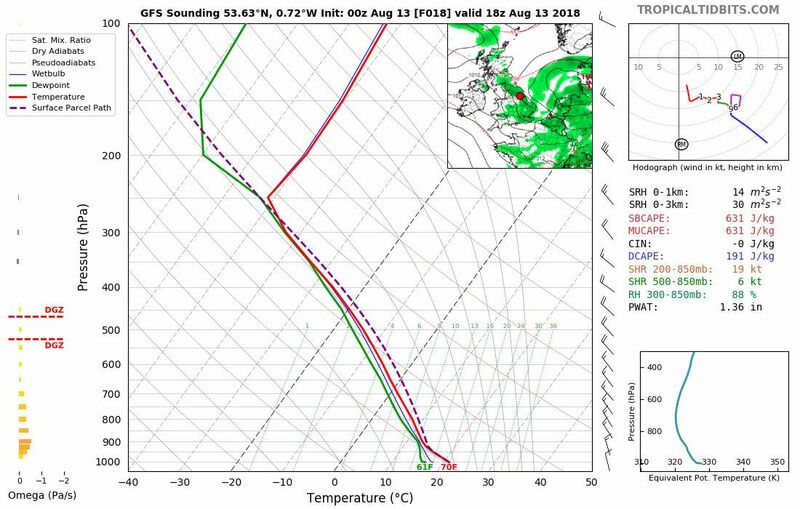 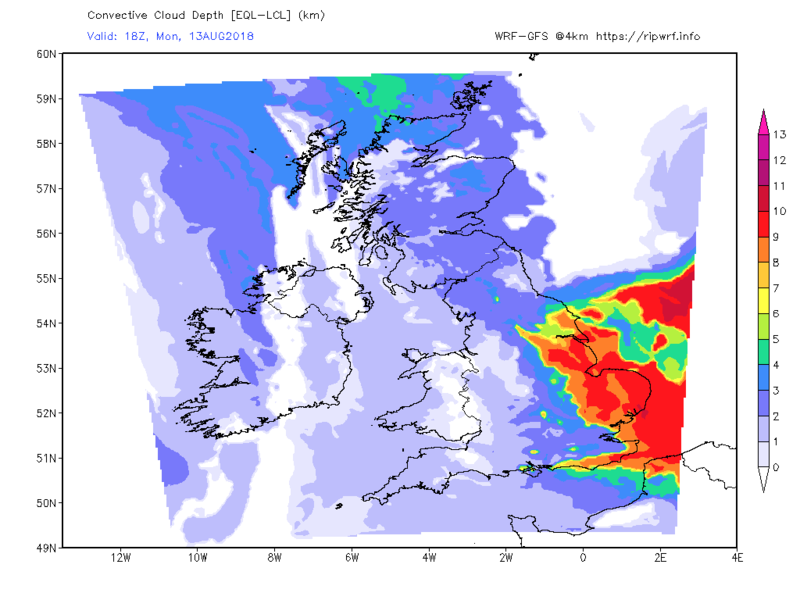 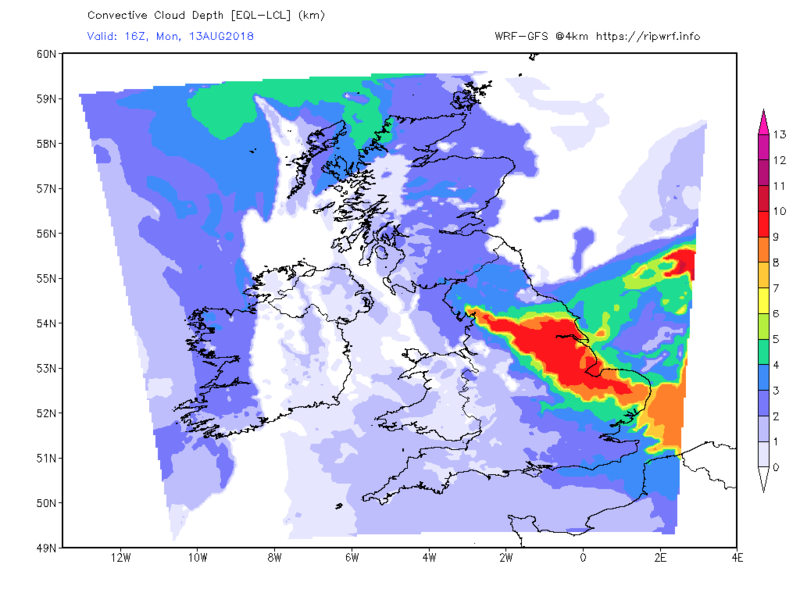 Regarding possible thundery activity in the east later some forecast convective cloud depths and a couple of soundings that would tend to support this.